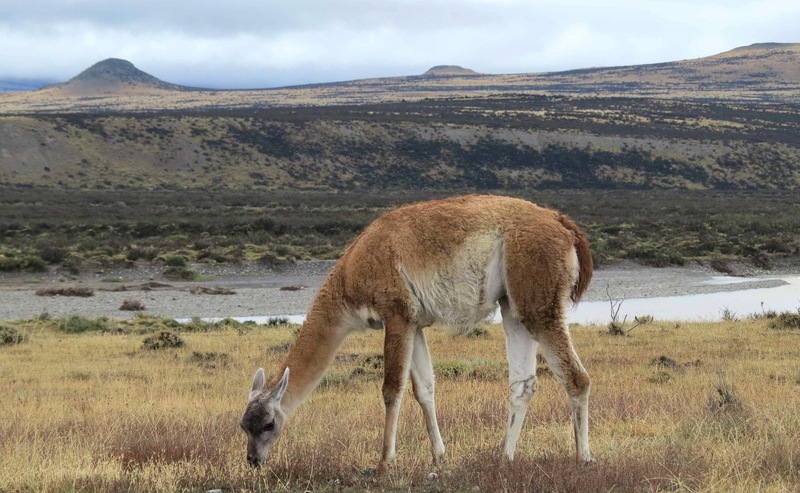 Apologies for not keeping the blog very well up to date these days but Patagonia is not the best place to find good internet connections! We have been driving for hundreds of km on gravel roads, passing through very small villages (if we are passing through any villages at all) and sometimes we are struggling to find fuel. In Danish we would say that we are very far out onto the fields of Lars Tyndskid here! 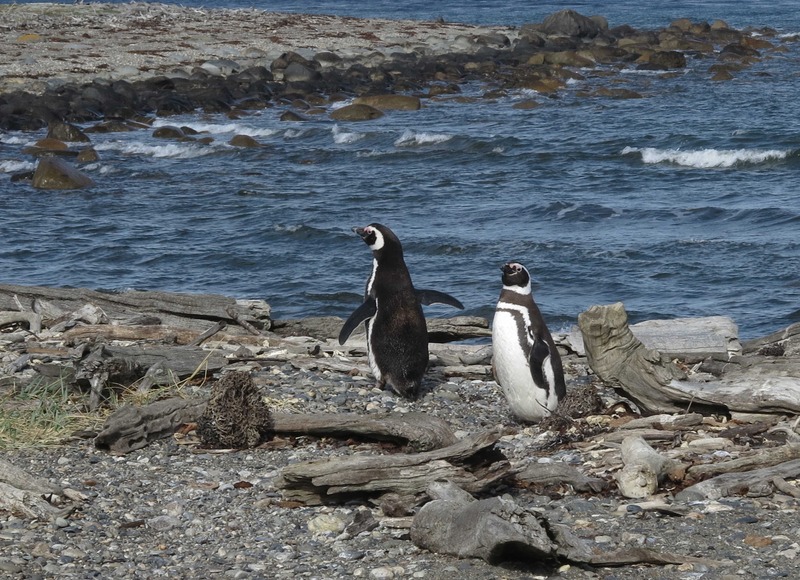 We stayed just outside the city of Punta Arenas. 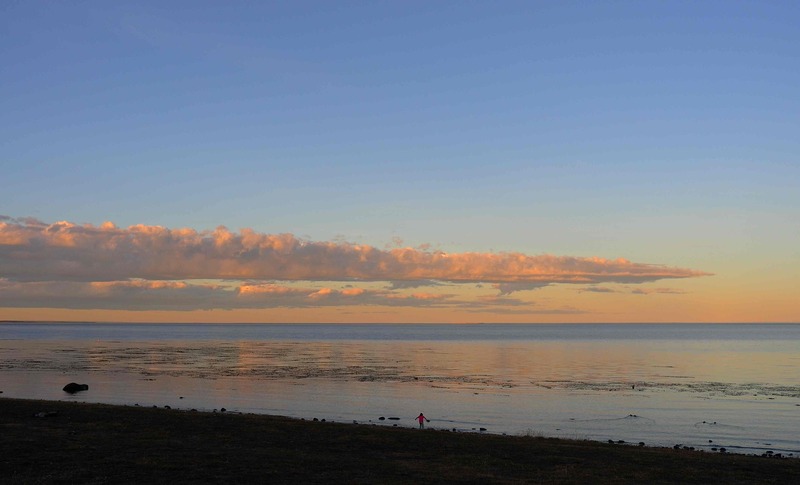 Here camping on the shore of the Strait of Magellan. 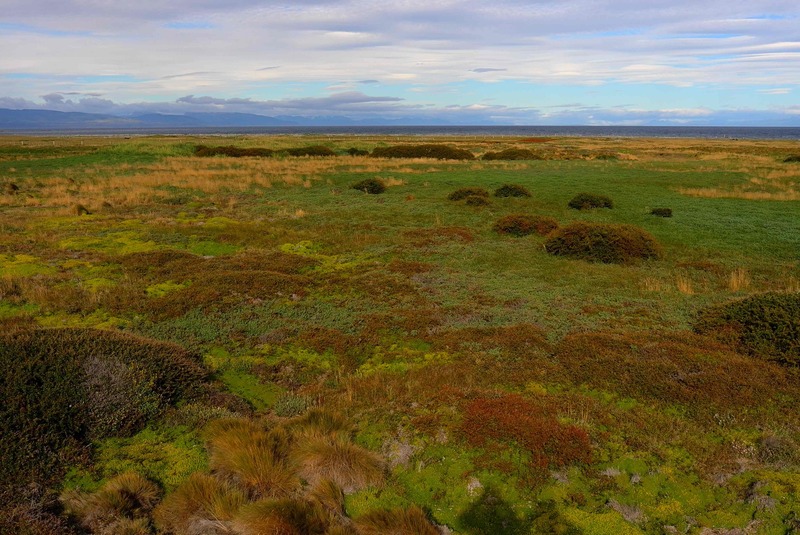 Nearby was a colony of Magellanic Penguins so we went there through beautiful bog land and fields with sheep. 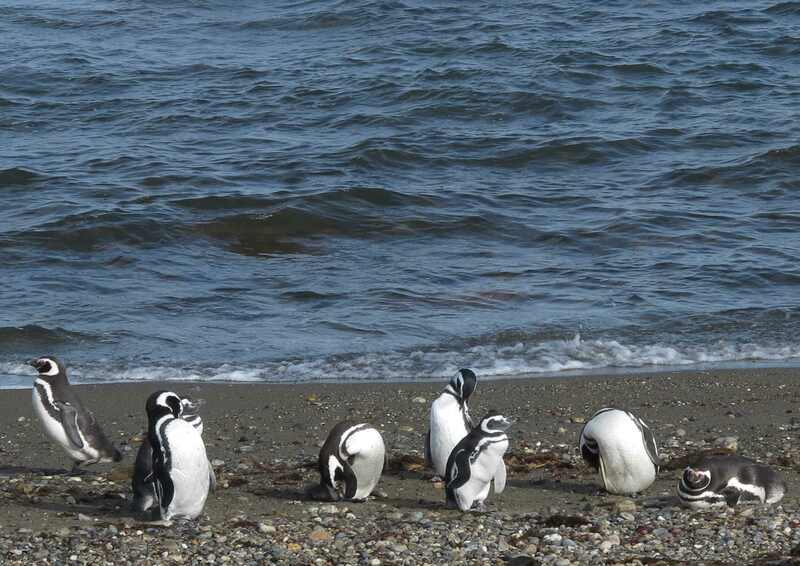 It was a bit at the end of the season but fortunately the penguins were there waiting for us! Who is there sleeping in the grass! 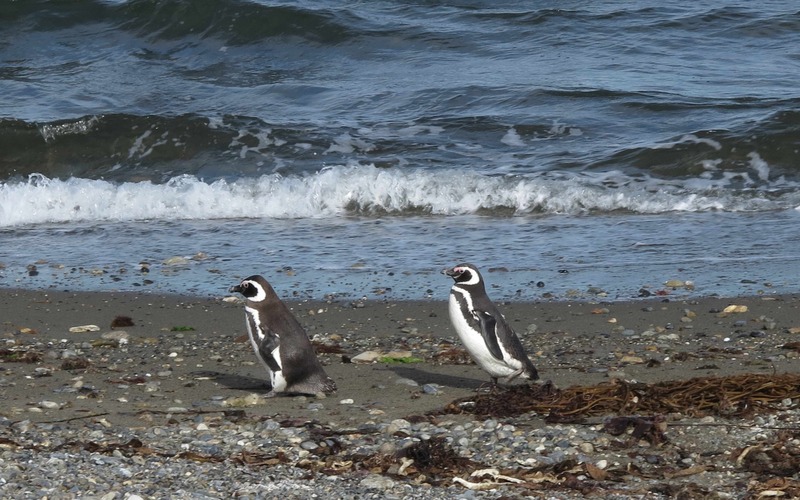 The Magellanic Penguin makes its nest in the ground close to the shore. 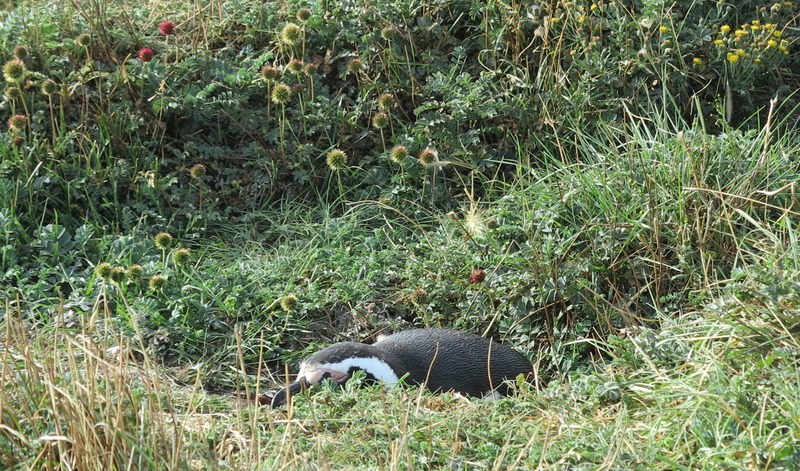 Here two baby penguins at the entrance to the underground nest. 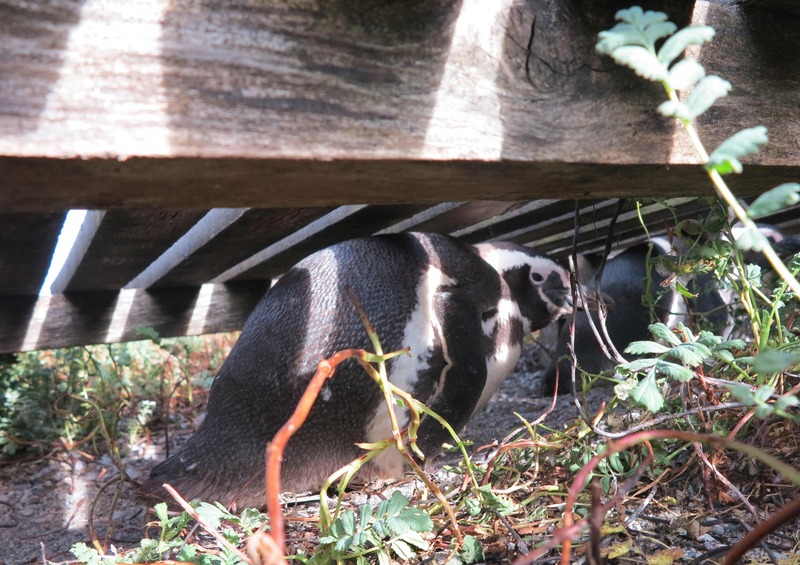 And a baby penguin under the wooden walkway. I am not here! The parents were too lazy to dig a nest in the ground? 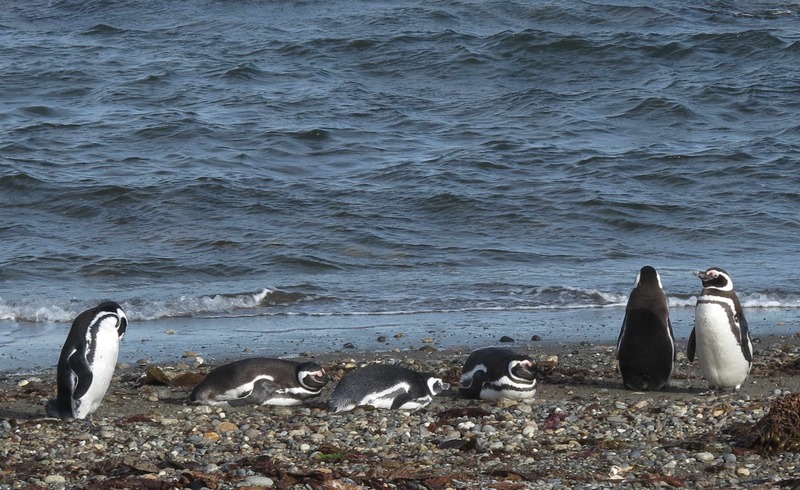 Busy penguin life, always a lot of feathers to groom. 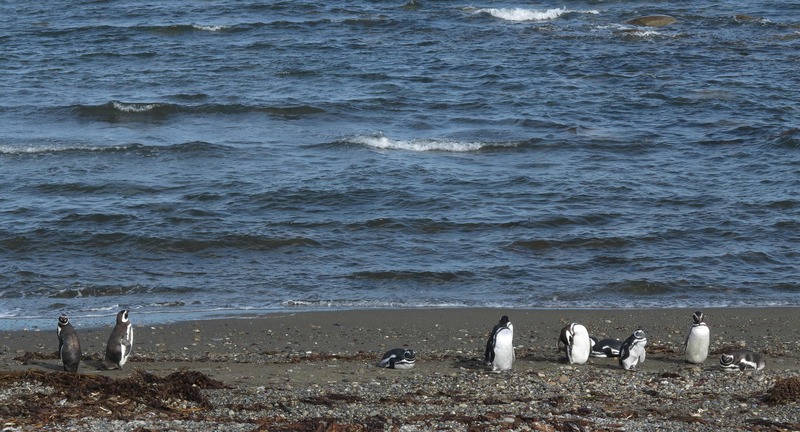 Ok, I had enough of standing around on the beach. Let’s go home. 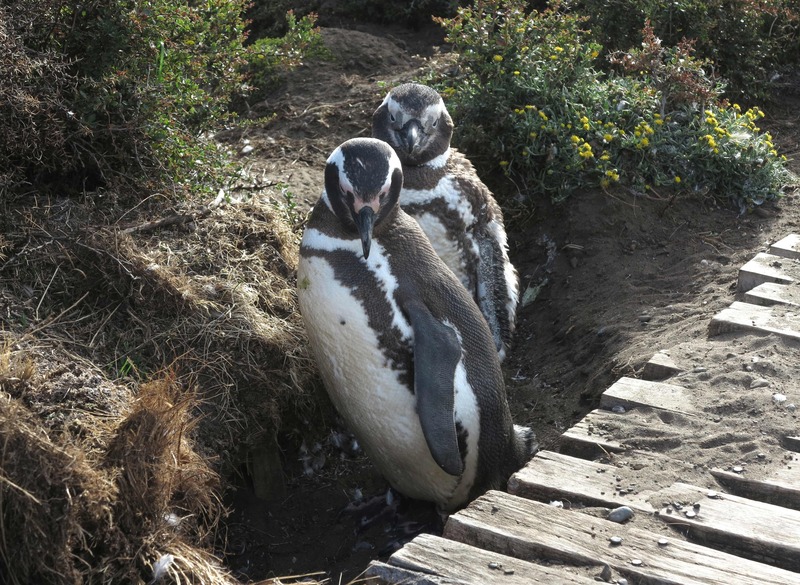 The Magellanic Penguin is monogamous so husband and wife stays together for all their life. Poor the husband! Keeping up appearances! 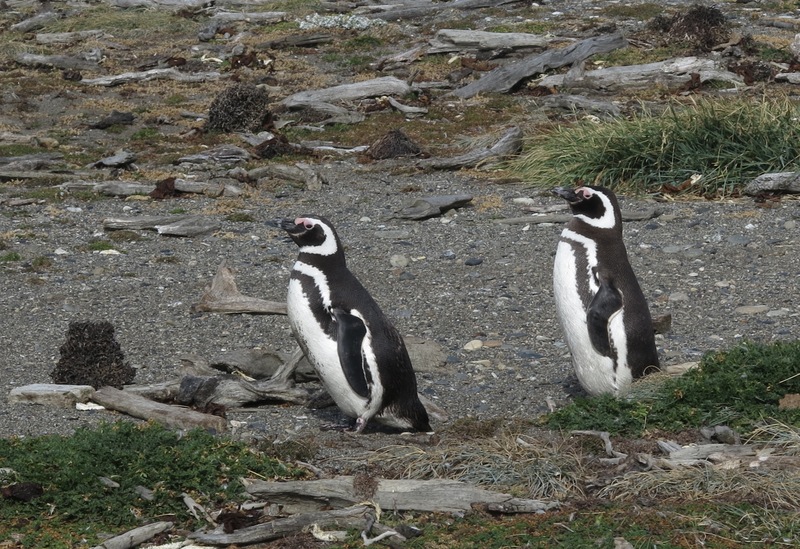 A walking penguin is a sight that makes you smile. 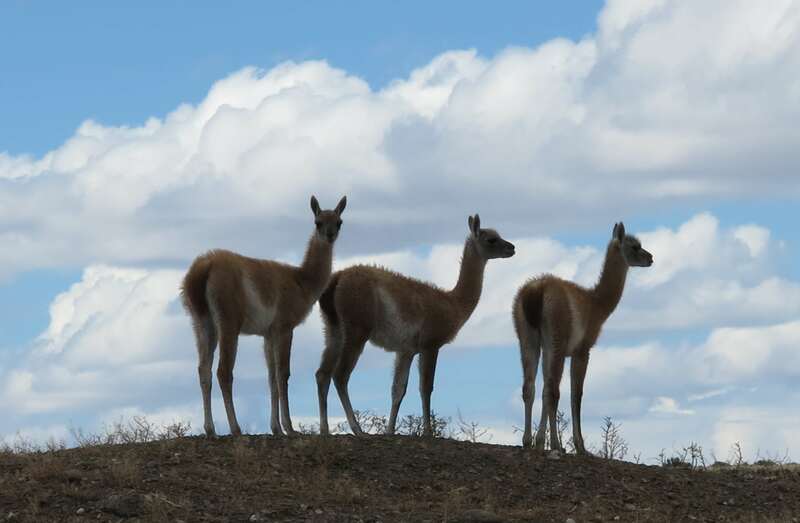 From El Chalten we drove south and entered Chile again to visit Torres del Paine. And again it was raining! 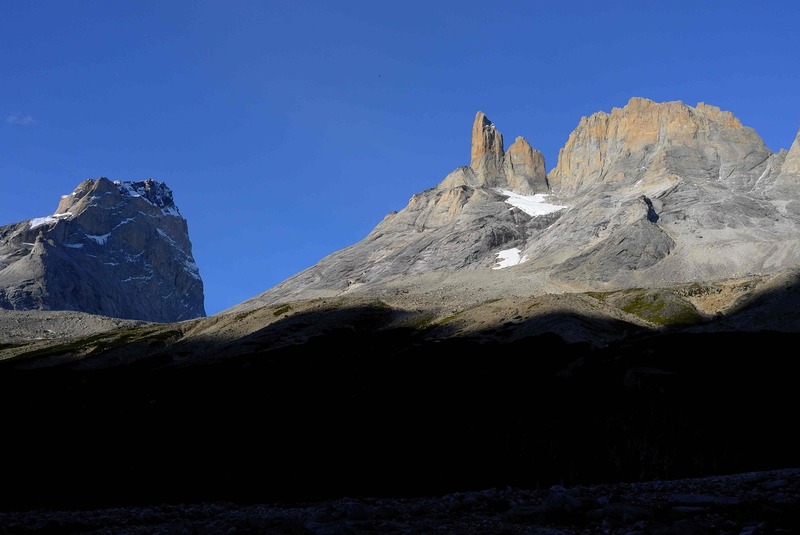 But fortunately it cleared up and we spent 3 great days in the national park, we walked 60 km with 2800 m altitude gain, we saw the famous granite towers and we were lucky to sleep all alone under the full moon in the beautiful Valle del Frances (special permit!). Here are the photos. Toro Seduto at the shore of Lago Nordenskjold. 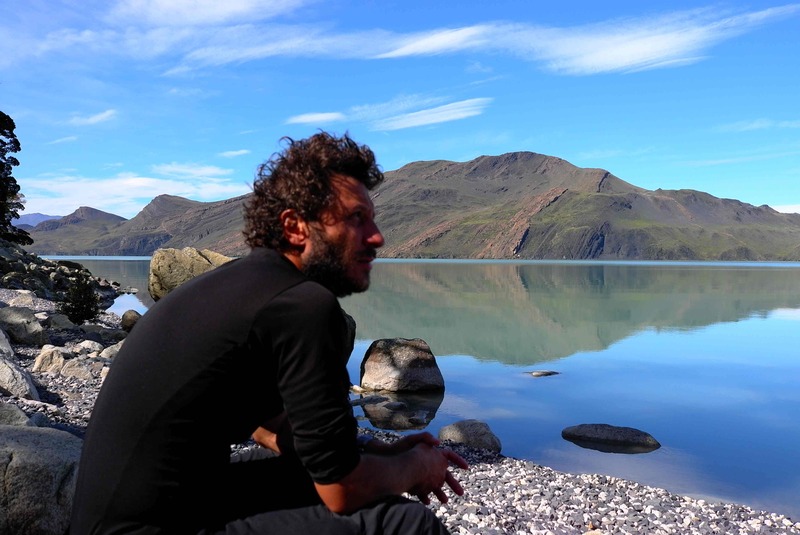 On the way to Valle del Frances we walked along the beautiful Lago Nordenskjold. 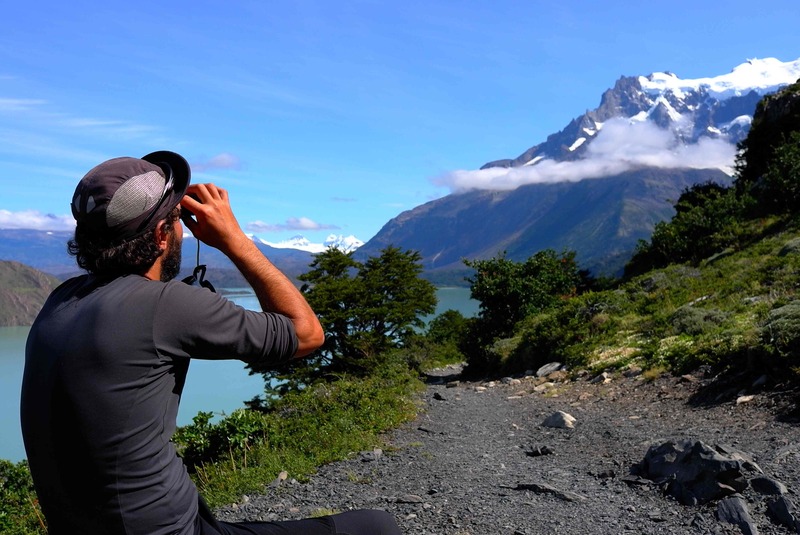 Toro Seduto is checking out the Cerro Paine Grande at the entrance to the Valle del Frances. 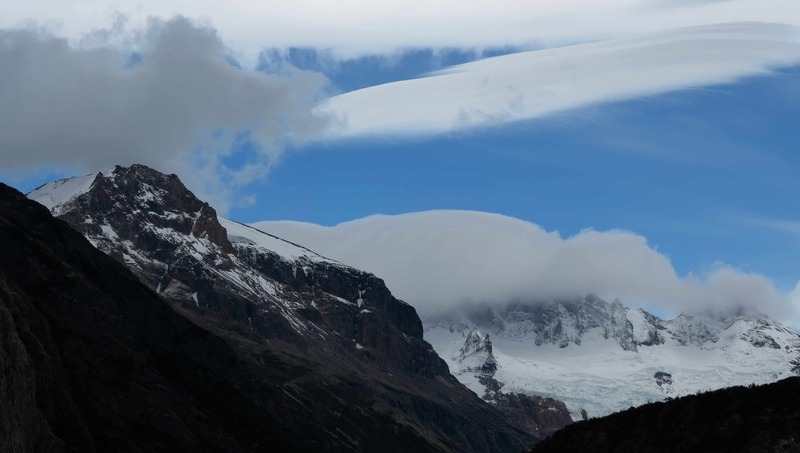 Nice ice “comb” on the Cerro Paine Grande created by the ice cold winds which frequently sweep across southern Patagonia. 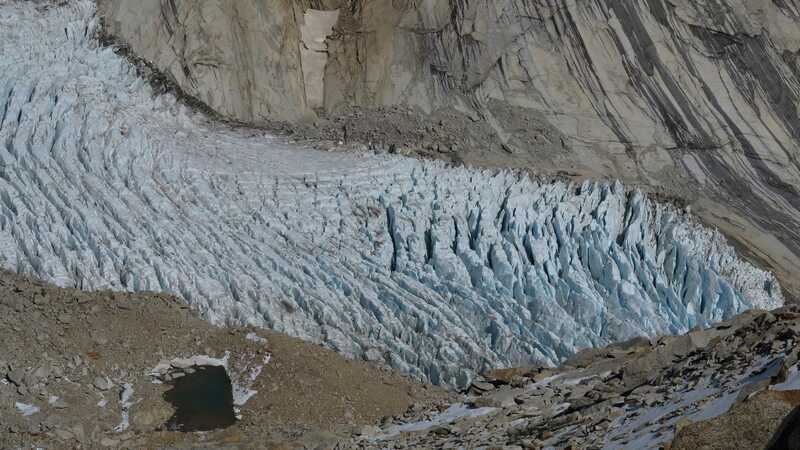 Graphical ice/snow/rock at the base of Cerro Paine Grande. 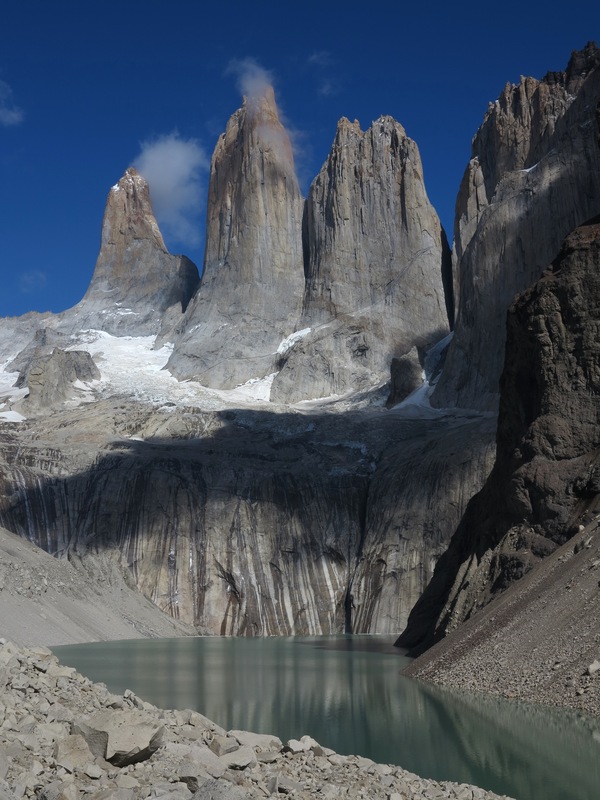 The “cuernos” or “horns” of Cuernos del Paine seen from Valle del Frances. 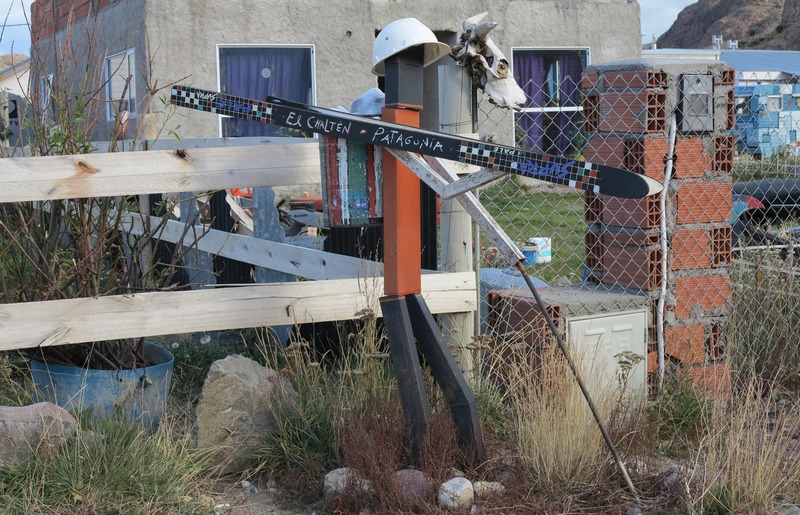 Cuerno Norte in the light of the setting sun. 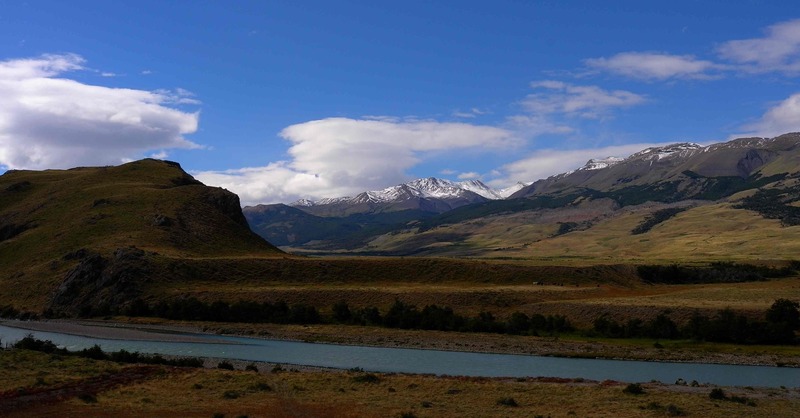 From left to right Cerro Espada, Cerro Hoja, Cerro Mascara and the grand Cuerno Norte. 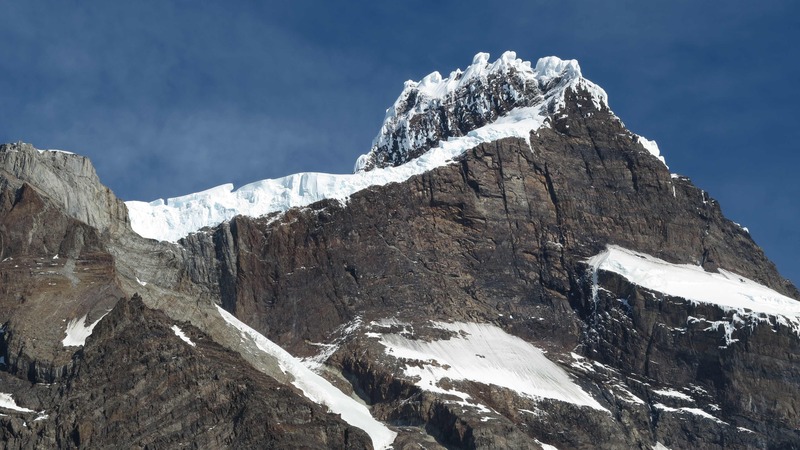 The top of the Cuerno Principal is just visible in the background to the far right. Cerro Fortaleza to the far left with Cerro Espada and Cerro Hoja in the light of the setting sun. View from Valle del Frances. 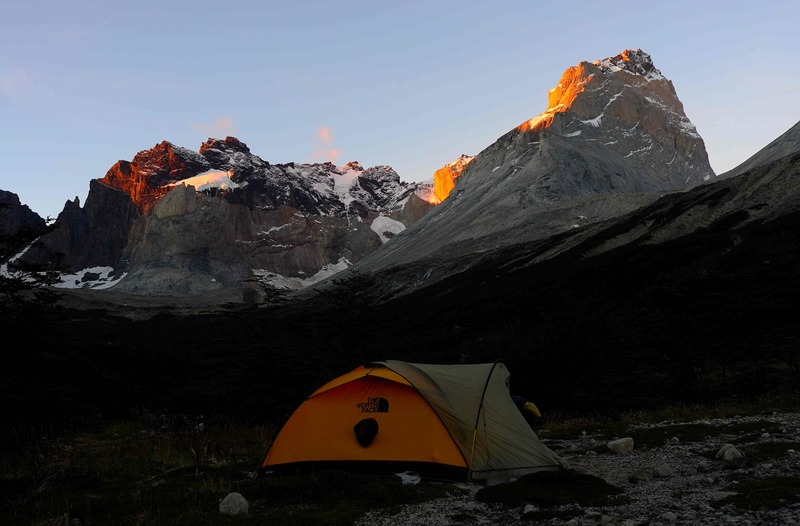 Our solitary camp site in Valle del Frances. The view back up the Valle del Frances as we walked out the next morning. Cuerno Principal and Cuerno Este. On the way back we had a long break at the shore of the Lago Nordenskjold. 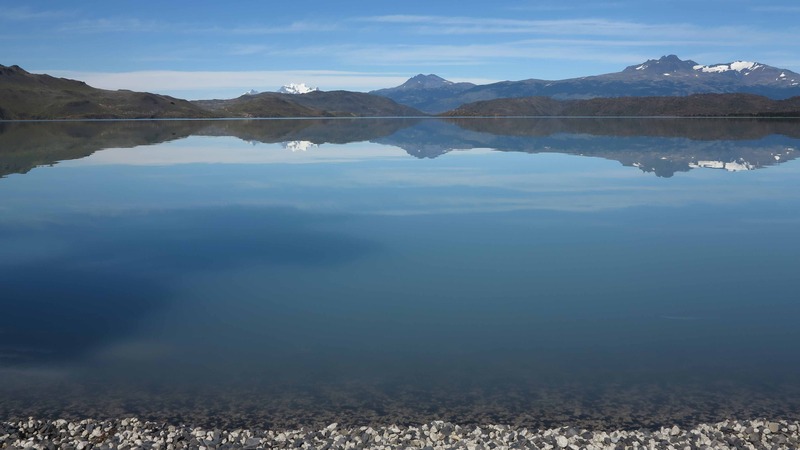 The weather was beautiful and the surface of the lake was like a mirror. The following day we made a quick day trip to see the famous Torres del Paine. Here in the morning sun. 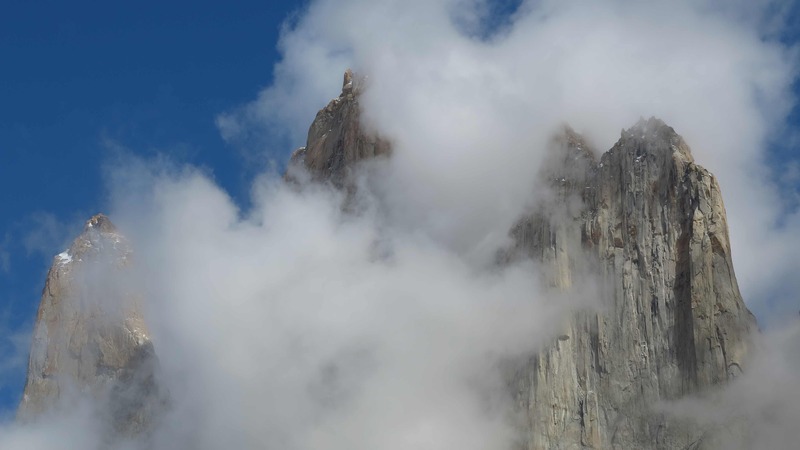 There were two climbers on the central tower (number two from the left). 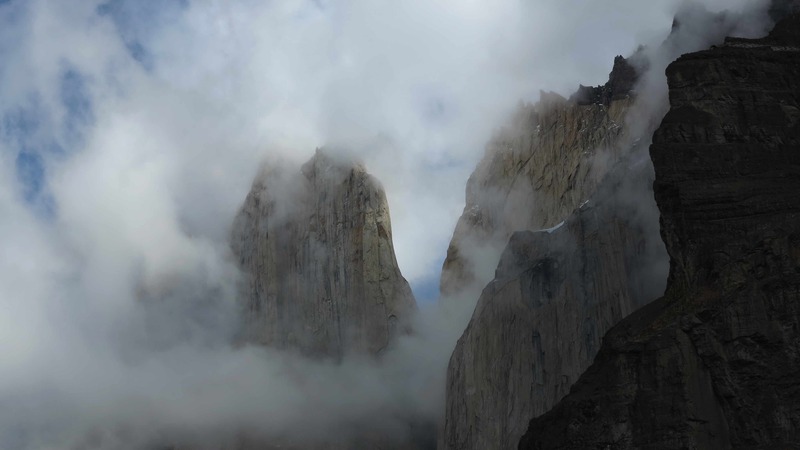 After about an hour the clouds started to concentrate around the granite towers but it only made the view more dramatic. 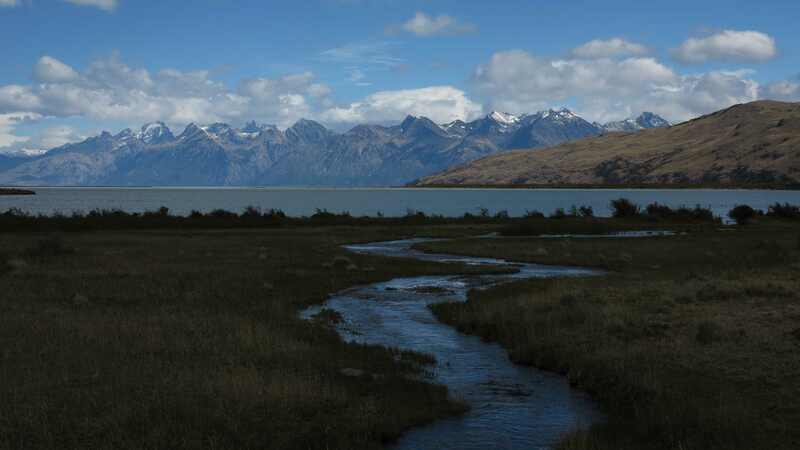 Finally, as we left the Torres del Paine National Park we got the full view of the peaks from across Lago Amarga. 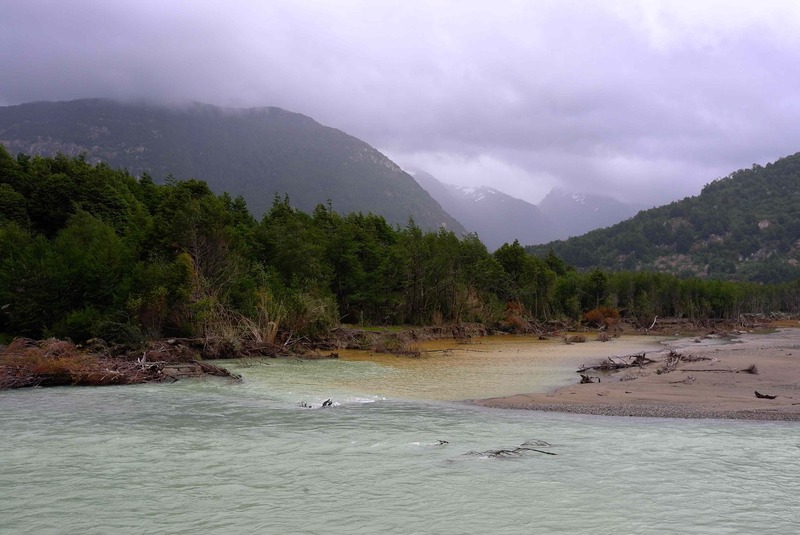 One beautiful morning we headed up along the Rio Electrico with the noble objective of reaching Gorra Blanca or at least the Paso Marconi at the edge of the Hielos Continentales / the continental ice sheet between Argentina and Chile. 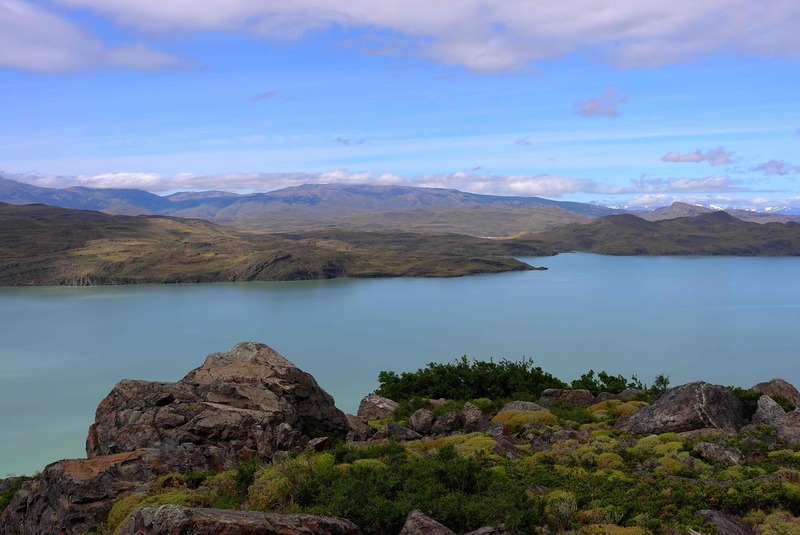 About 4 hours up the path we had to realize that we were in fact exhausted, our muscles all painful, our legs like rubber and so we spent the day sleeping on the rocky shores of Lago Electrico. Literally, we slept 8 hours there in the sun, under the blue sky and in the clear fresh air. At 3 o’clock in the afternoon we woke up feeling much more rested. And very noble! 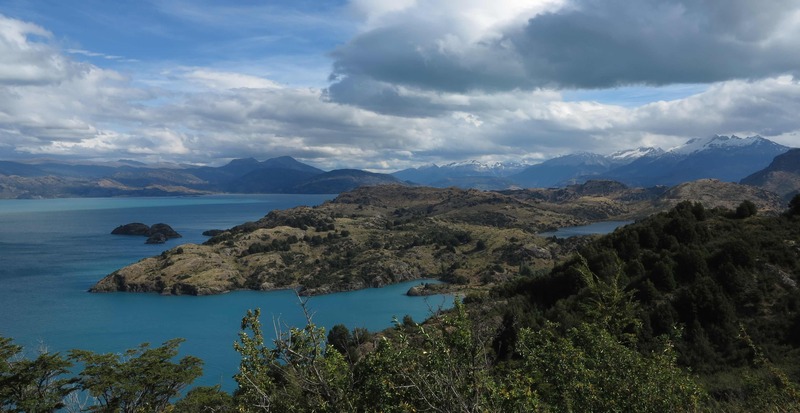 The next day we went up to Paso del Cuadrado from where the view was incredible. Photos below! 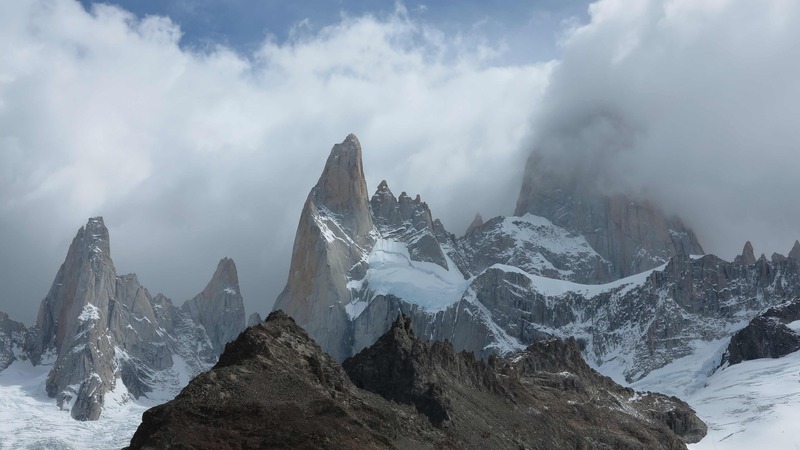 Cerro Electrico and Monte Fitz Roy. 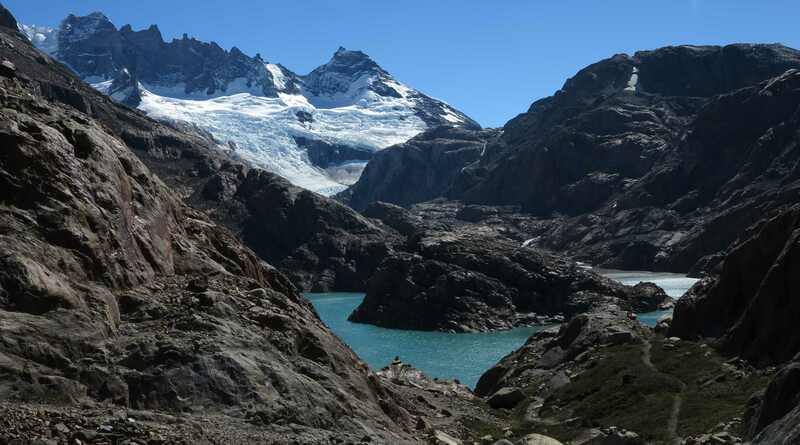 Lago Electrico with Cordon Marconi and Glaciar Marconi in the background. 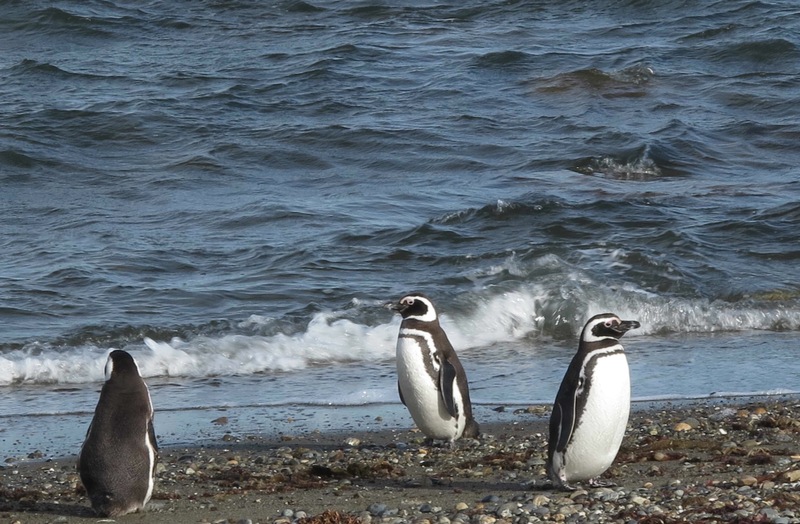 The great and noble alpinists spending the day on the beach – on the rocky shore of Lago Electrico. 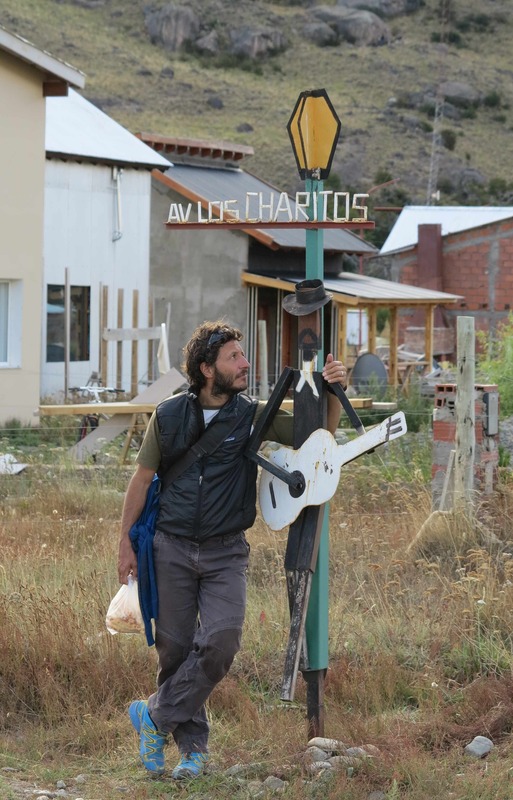 En route to Paso del Cuadrado – Ag. Guillaumet, Ag. 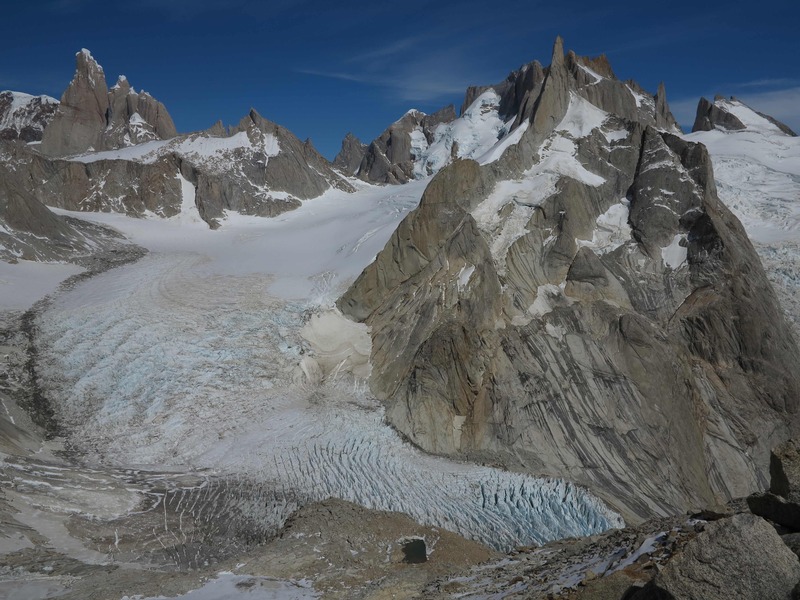 Mermoz and Monte Fitz Roy. 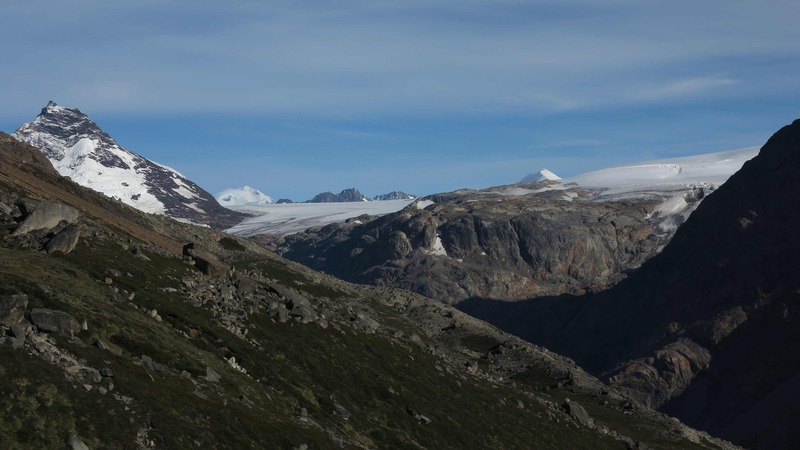 View to the continental ice sheet to the west, the third largest in the world after the ice caps on Antarctica and Greenland (Cerro Marconi to the left and Paso Marconi in the center). 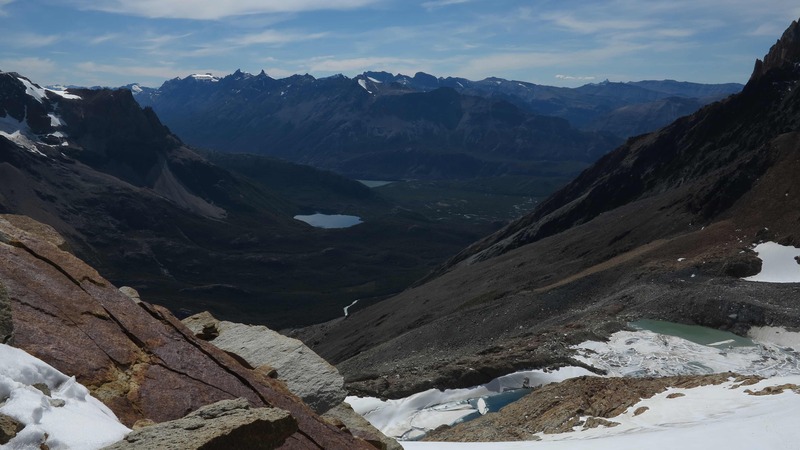 Marco enjoying the view to Gorra Blanca and Paso Marconi. 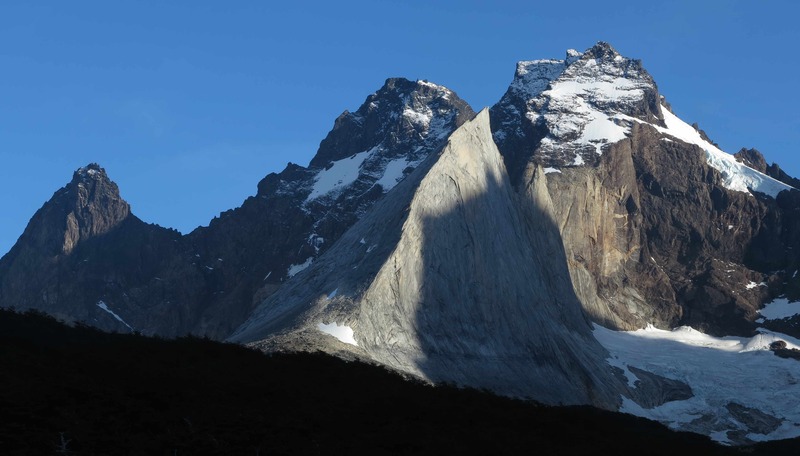 Gorra Blanca barely visible as a rounded white peak behind Cerro Neumeyer. 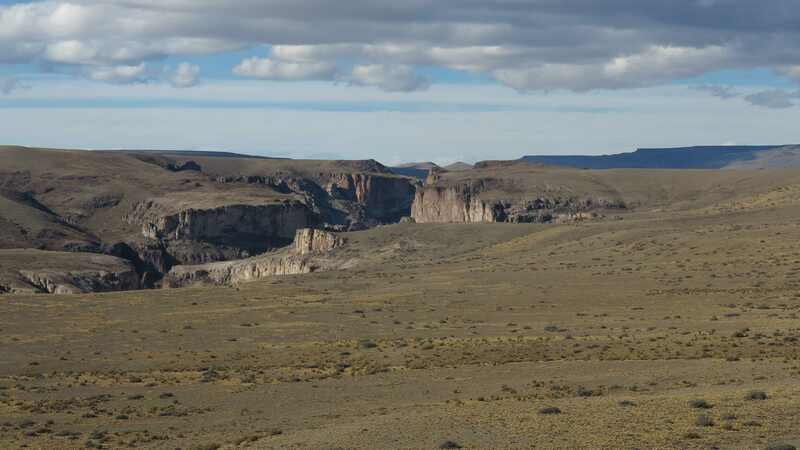 View down the valley to the east, down below flows the Rio Electrico. 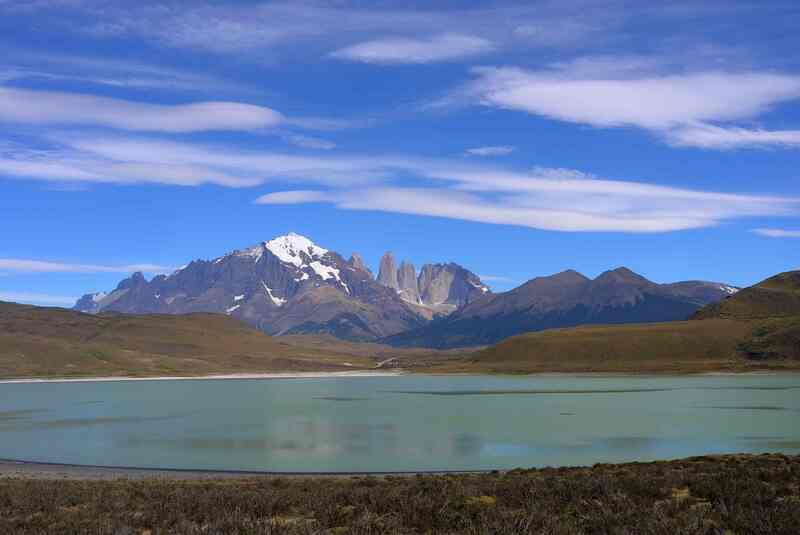 Just below the Paso del Cuadrado we had a lovely view across a small glacial lake to Ag. Guillaumet, Ag. 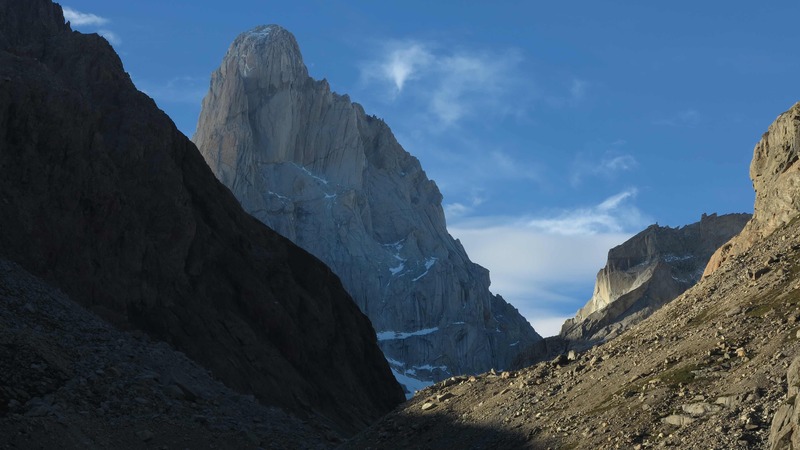 Mermoz and Monte Fitz Roy. 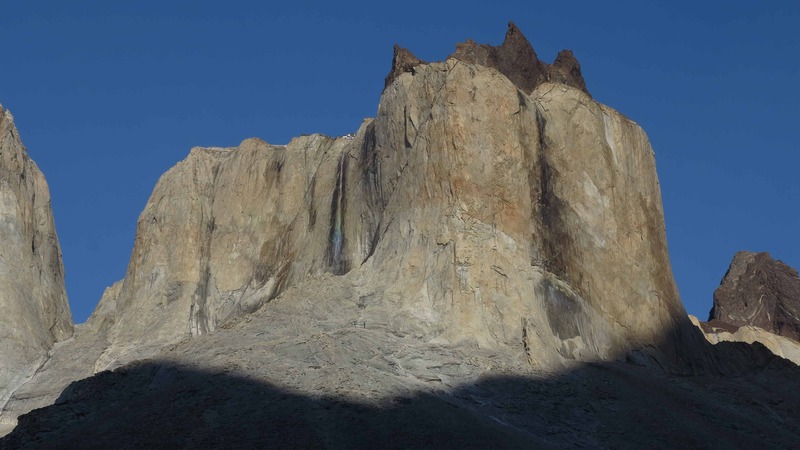 Up there is the Paso del Cuadrado, to the right of the big square rock. 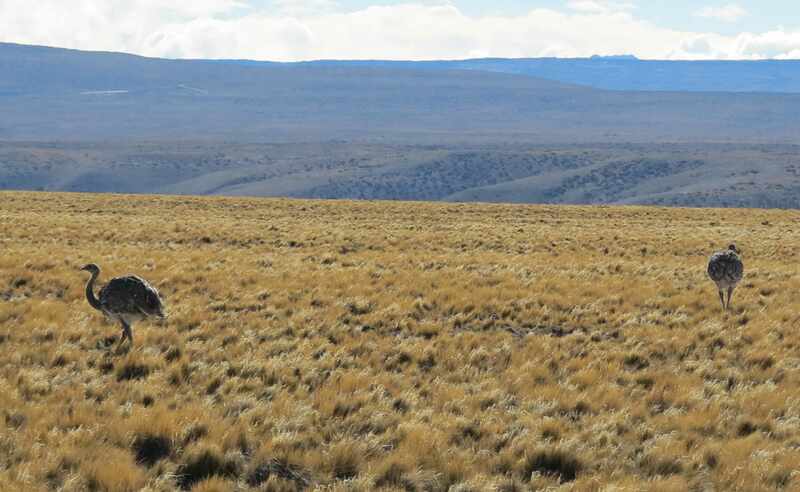 Finally arrived at Paso del Cuadrado we were awarded with an AWESOME view! 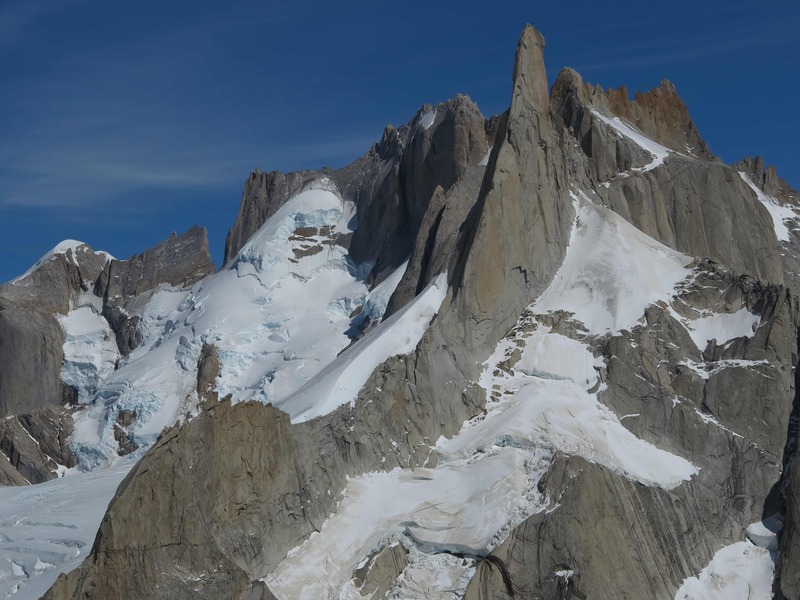 Monte Fitz Roy was right there in front of us (right) flanked by Ag. Mermoz and Ag. Guillaumet. 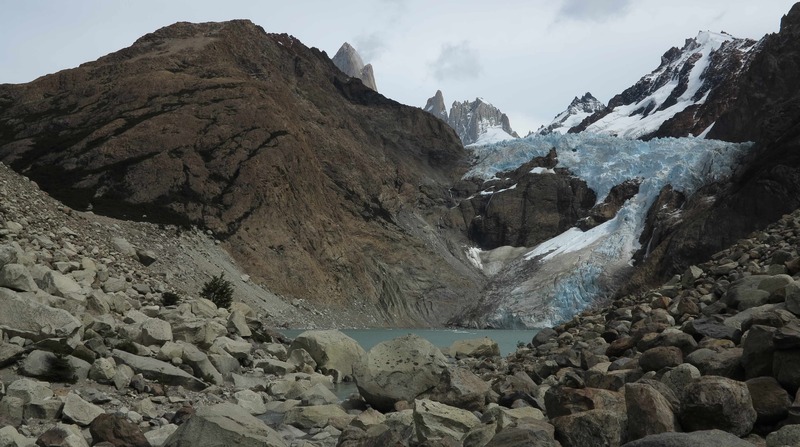 In the background to the right of Fitz Roy stood Cerro Torre. 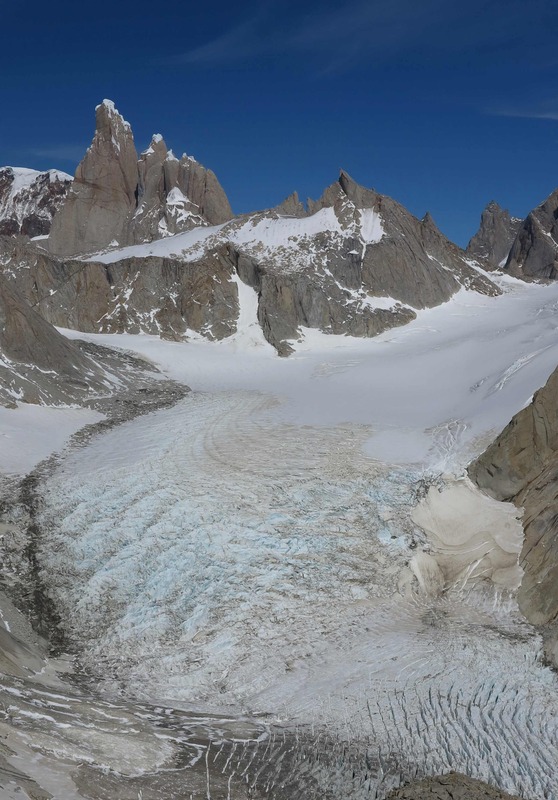 A more expanded view with Cerro Torre to the far left with the grand Glaciar Fitz Roy Norte flowing down the center and to the right the beautiful peak of Cerro Pollone flanked by the Glaciar Pollone to the far right. 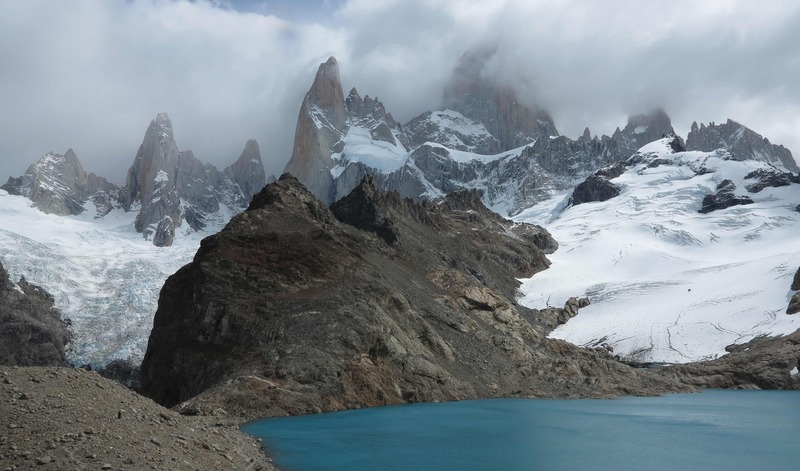 Cerro Torre and the Glaciar Fitz Roy Norte. 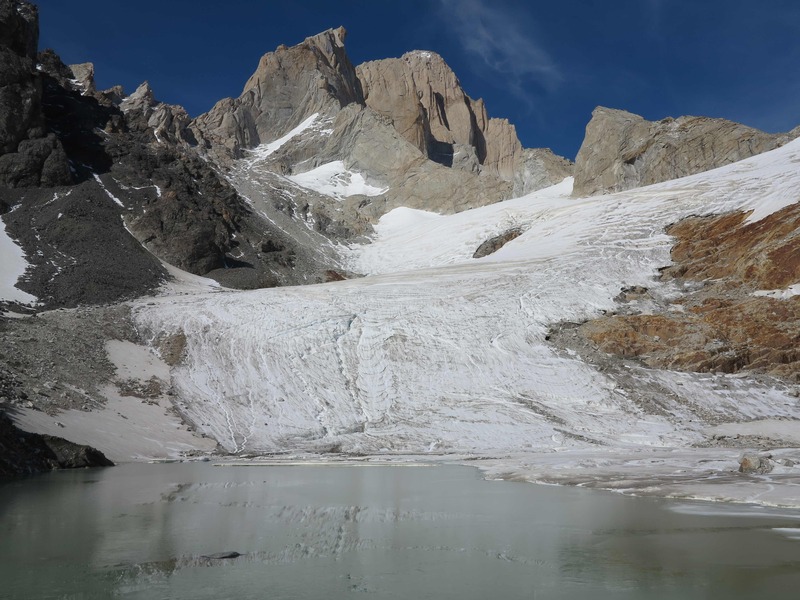 Cerro Torre with the famous ice mushroom on top. 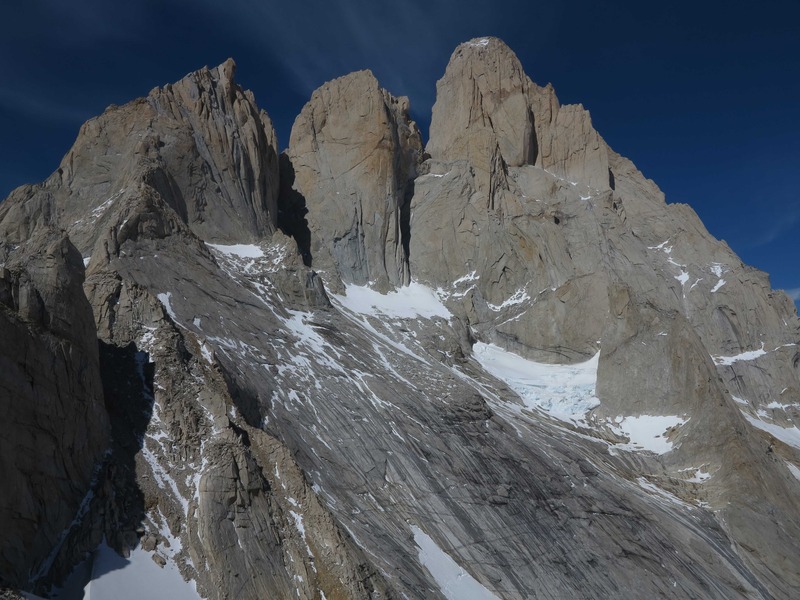 On the left side of Cerro Torre is the famous “compressor route” on the southeast face, climbed by an Italian team led by Cesare Maestri in 1970. 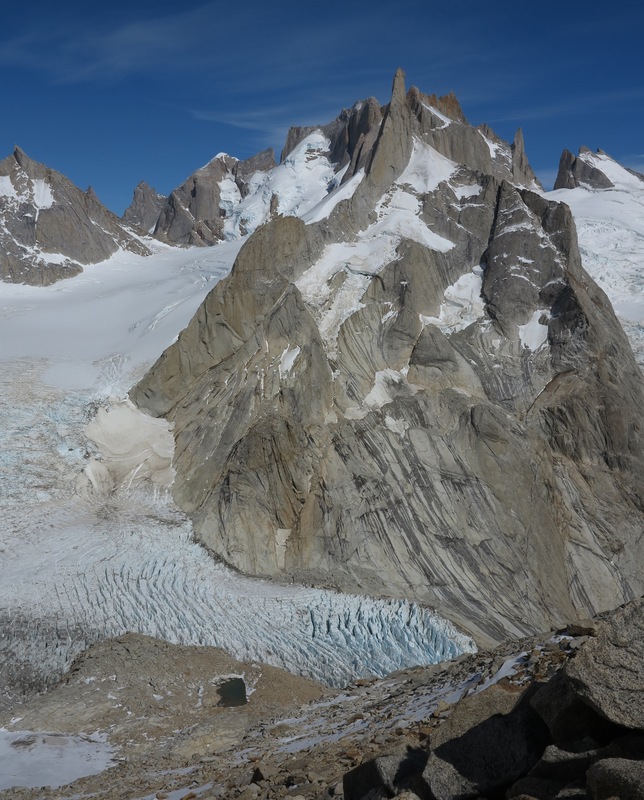 They brought a compressor to bolt the route but only made it to the end of the rocky part of the mountain, below the ice mushroom. 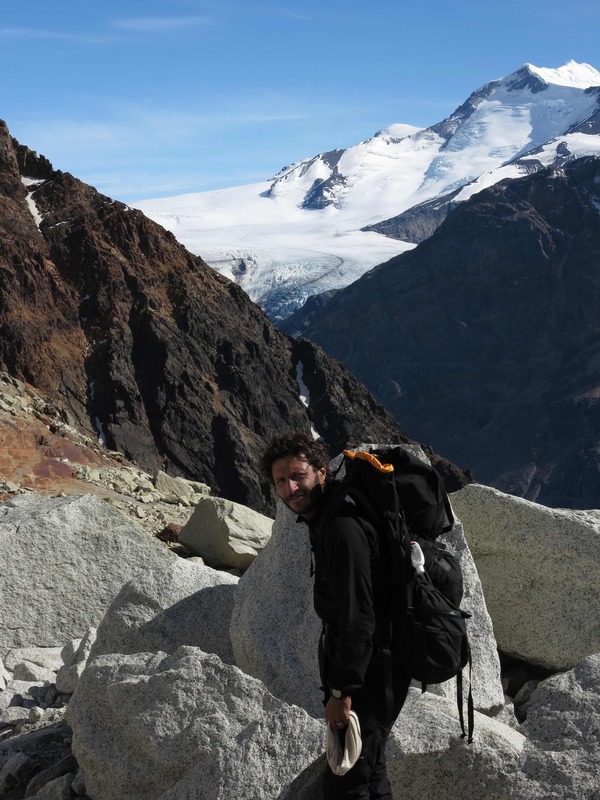 Maestri claimed that “the mushroom is not part of the mountain” and did not continue to the summit (quote Wikipedia)! 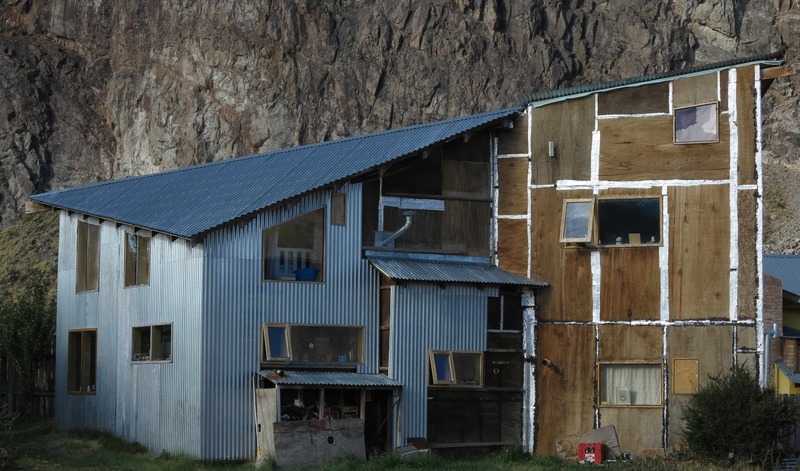 The compressor is still up there but two young climbers from Canada and the USA removed the bolts in 2012. Certainly a summit with a history! 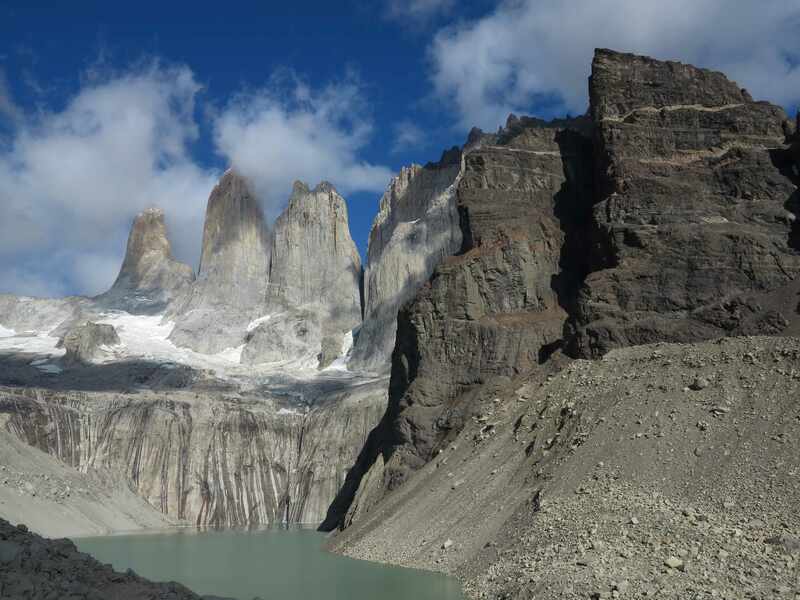 To the left of Cerro Torre stands Ag. Torre Egger, Ag. Herron and Ag. Standhardt. The “compressor team”! 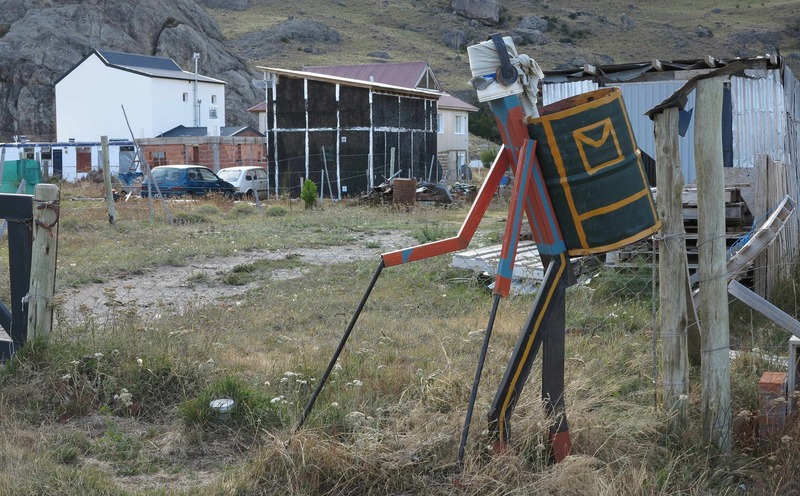 Maestri standing. 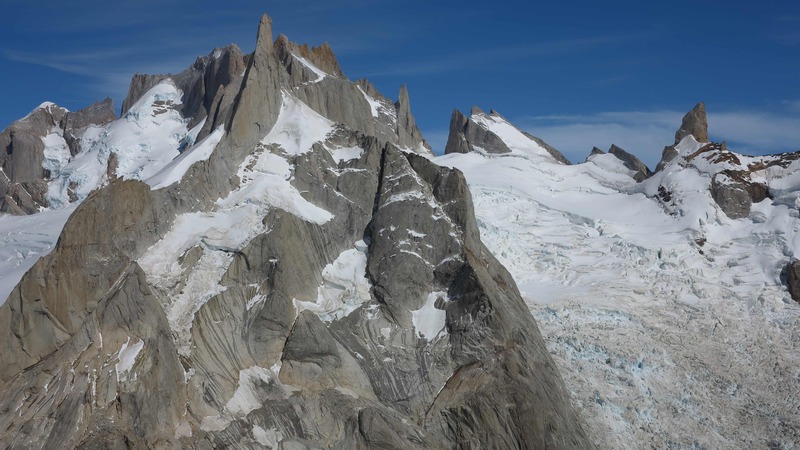 Cerro Pollone and Glaciar Pollone. 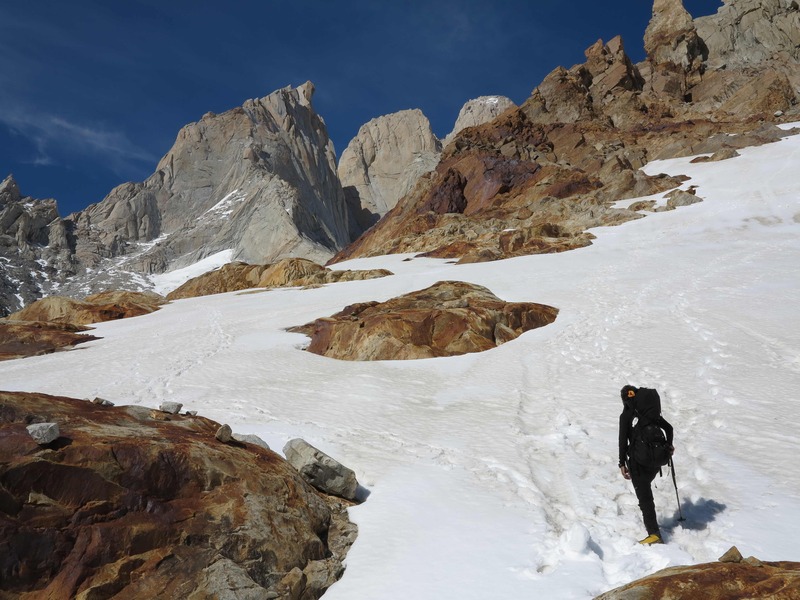 The foot of the Glaciar Fitz Roy Norte. 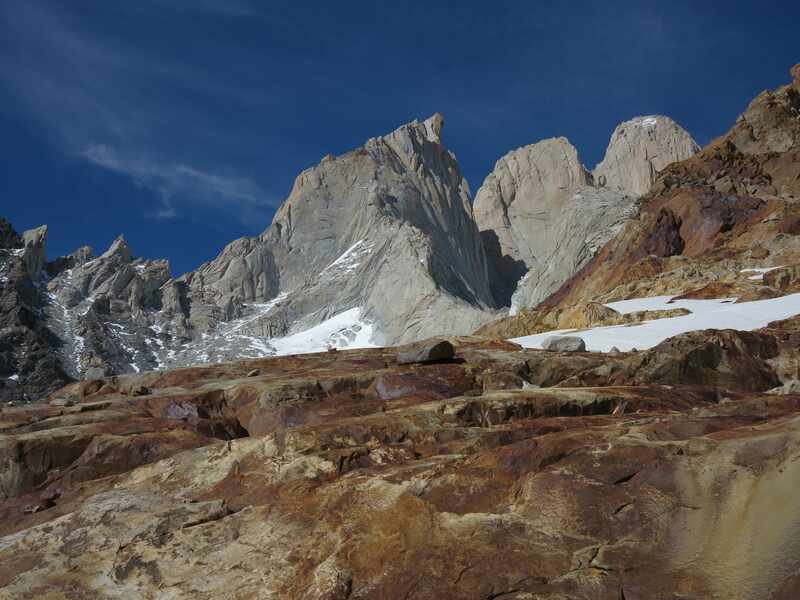 Cerro Pollone and Glaciar Fitz Roy Norte. 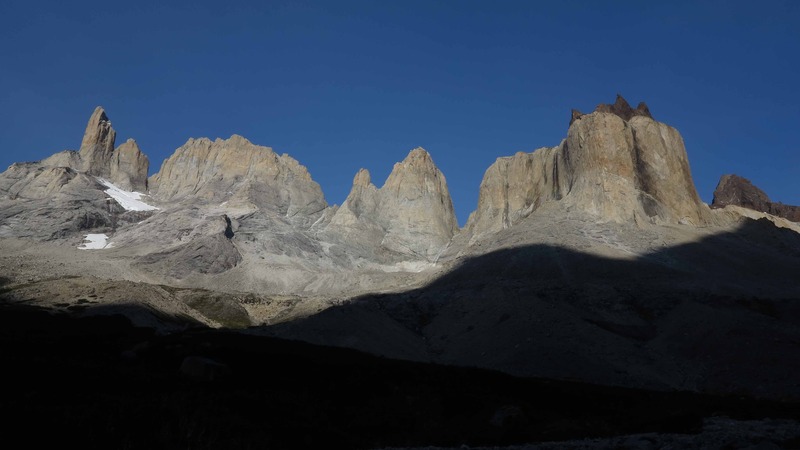 The skyline of El Chalten looking East towards Fitz Roy, Cerro Torre and to the far left Cerro Solo. 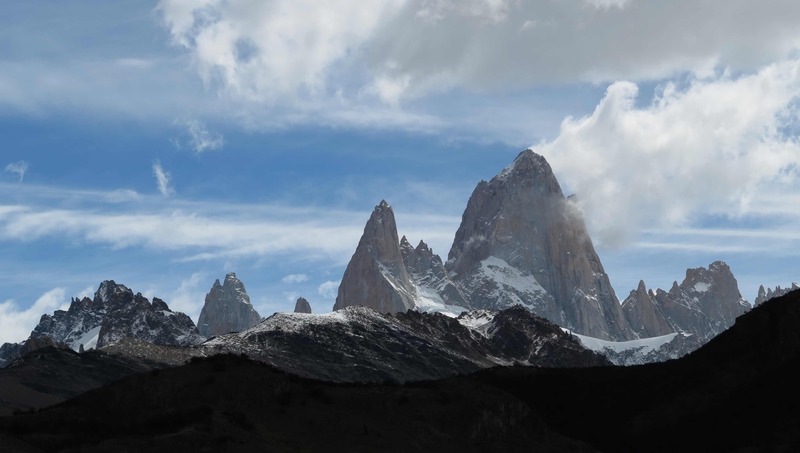 Cerro Torre, Torre Egger, Cerro Poincenot and Monte Fitz Roy (left to right). 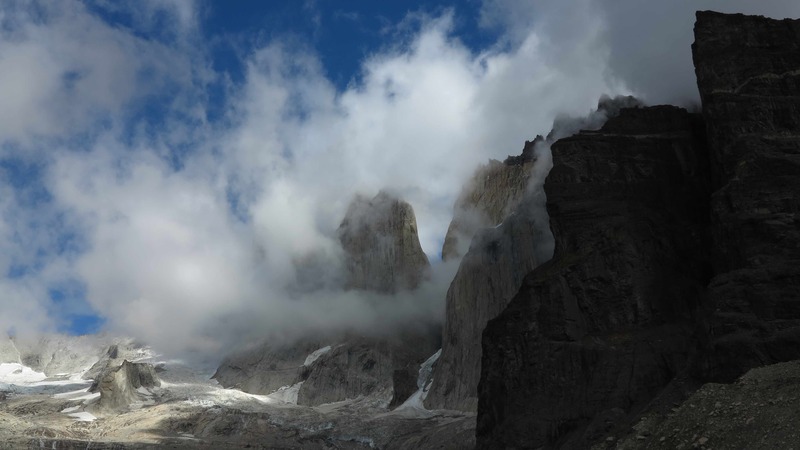 Clouds blowing off the granite peak of Monte Fitz Roy. To the left Cerro Poincenot and behind the Bifida. Early morning view up the valley of Rio Electrico. 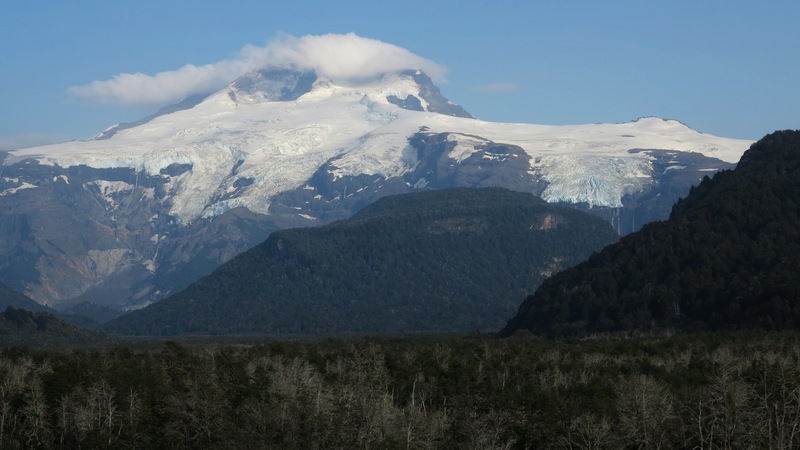 In the background the large Glaciar Marconi. 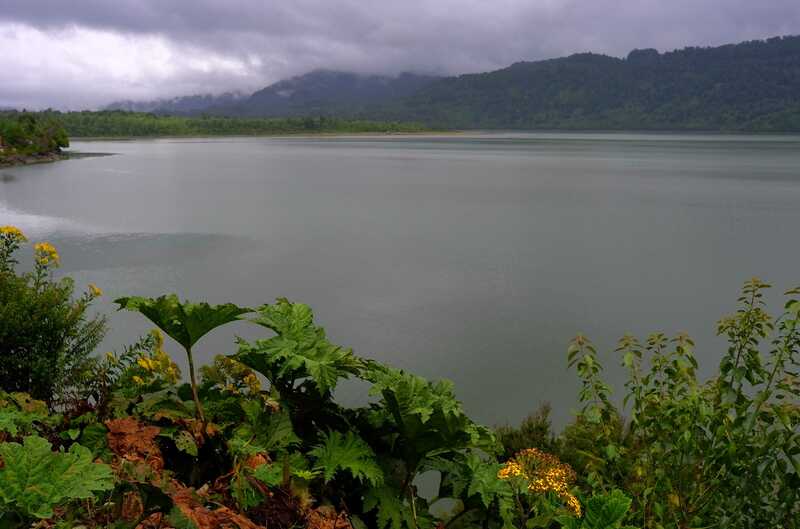 Laguna Piedras Blancas on a cloudy day. 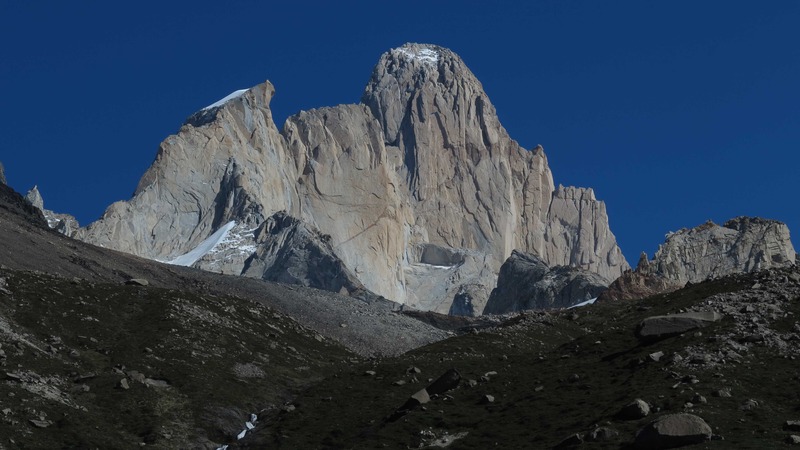 The peak of Fitz Roy is just visible. 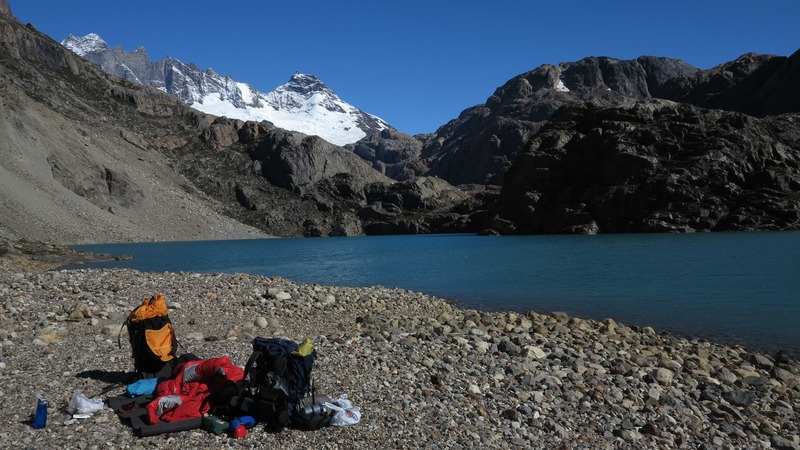 Laguna de Los Tres at the foot of the Glaciar de Los Tres. 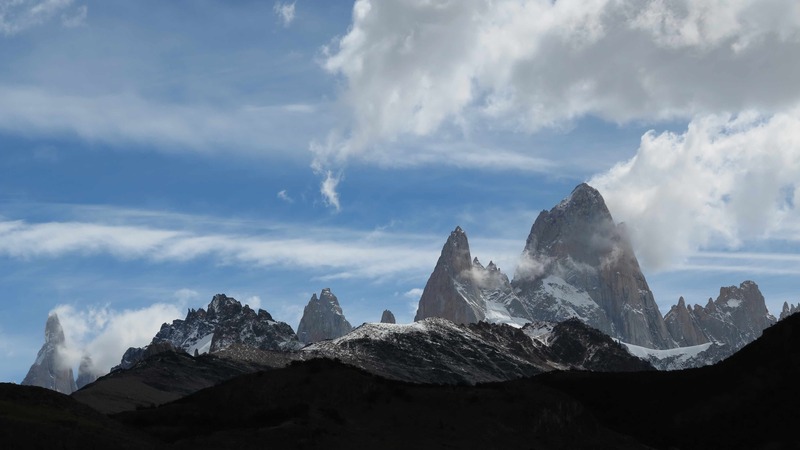 In the background Fitz Roy partly hidden in the clouds and to the left Cerro Poincenot and further left Ag. Saint Exupery. 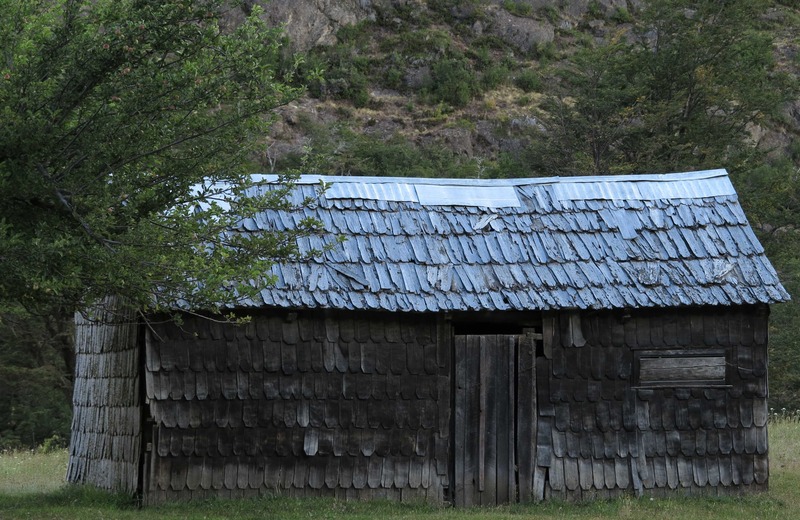 El Chalten, at the foot of the impressive granite peaks of Cerro Torre and Fitz Roy, has changed a lot since we were last there 3 years ago. 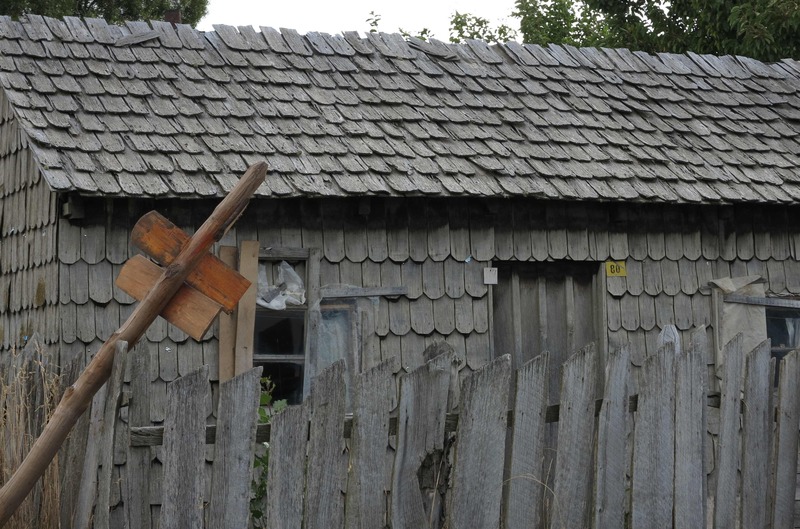 But behind the hotels and restaurants on the main street it is still a nice and messy little pioneer town with a lot of things to discover. For example the best, BEST alfajores in Argentina in a small bakery on a side street (next to a shop selling green plants/flowers) we can’t remember the name so you will have to explore the town to find it yourself! 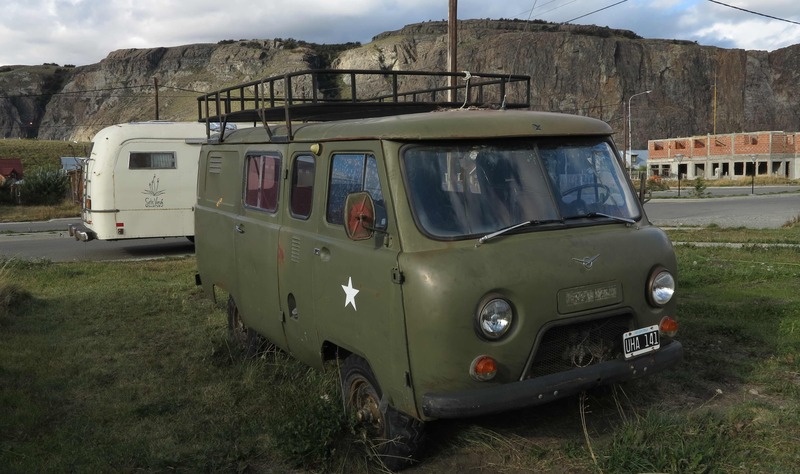 A UAZ in El Chalten! From Russia with love. 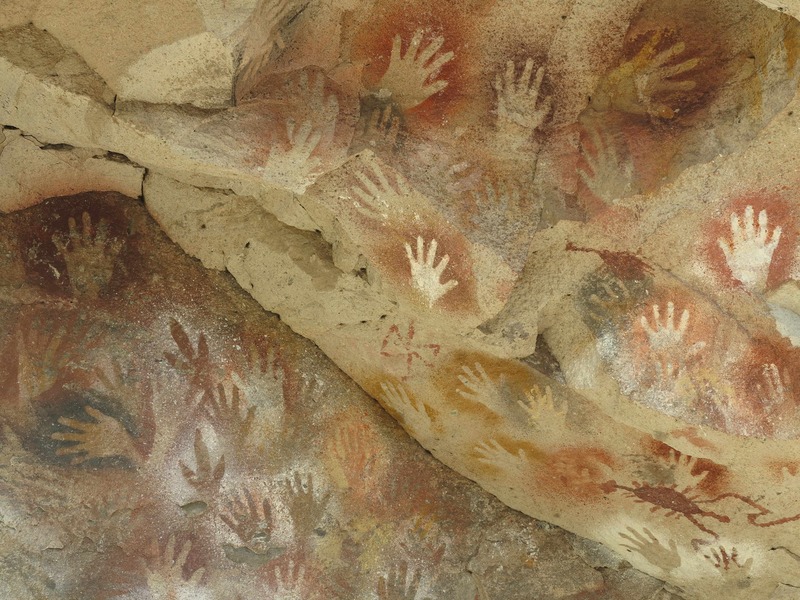 In the middle of nowhere, in the heart of the Patagonien hills, there is a canyon with painted hands of guanaco hunters dating back 9000-13000 years. 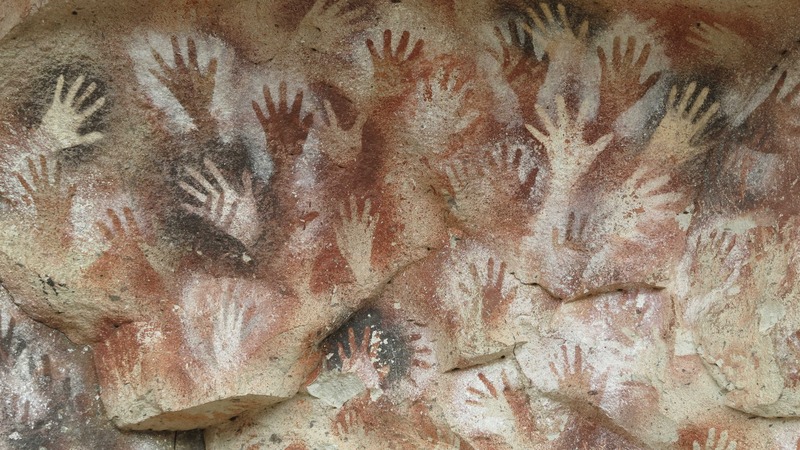 “Cuevas de las Manos” is a world heritage site and it is worth the long drive to visit this remote but special location. 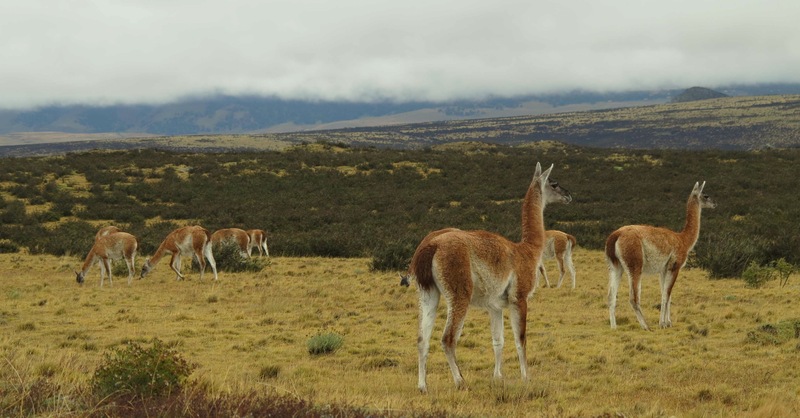 Wild guanacos still roam the hills like they did 10,000 years ago when the hunters painted their hands and images of guanacos on the walls of the canyon. 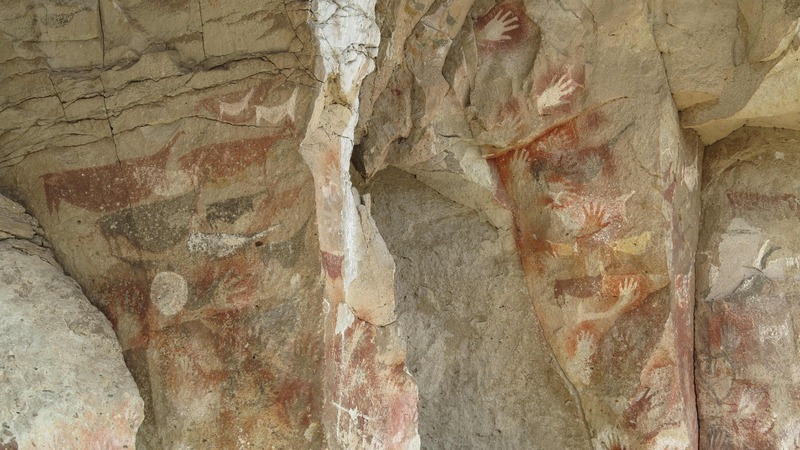 The guanaco hunting hand-painters also hunted ostrich and one finds a few paintings of ostrich feet on the canyon walls, see below. 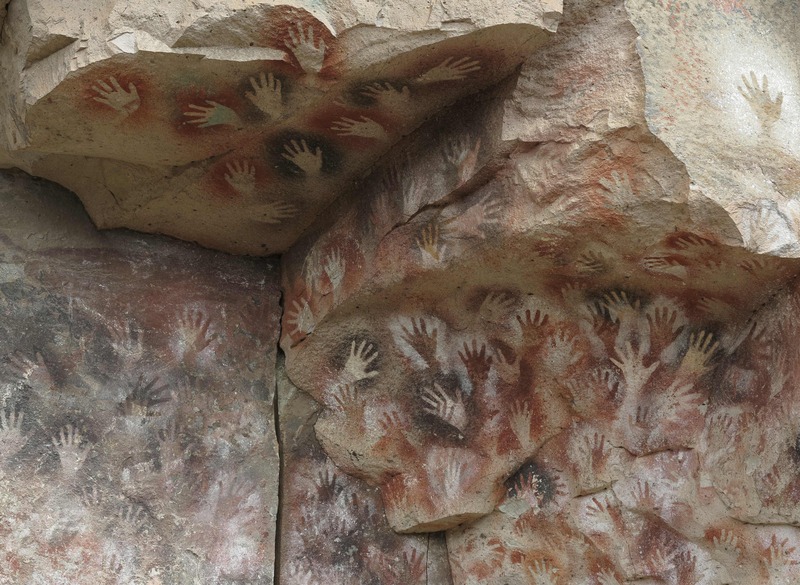 The famous Cuevos de las Manos! 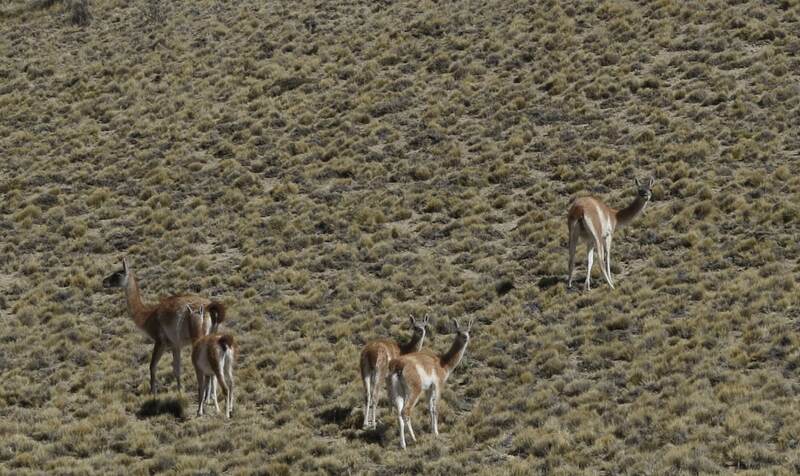 Elegant guanacos running across the canyon walls. There are two ostrich feet (poor!) 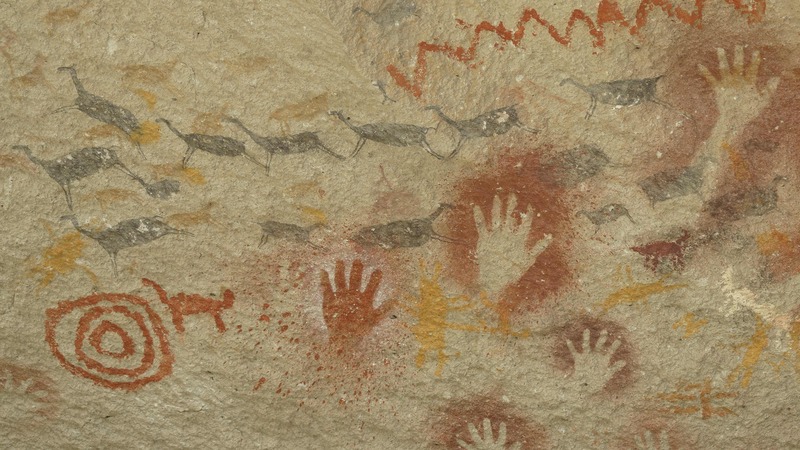 painted in between all the hunter’s hands (lower left half). After Aconcagua we drove south from Mendoza towards Bariloche. 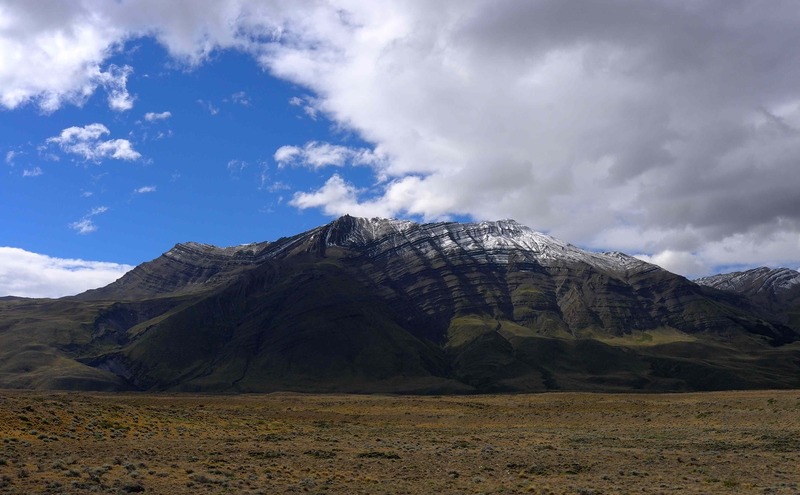 We were eating a lot and still feeling hungry, sleeping 12 hours per night and still feeling tired and we were a bit lost now that the Aconcagua expedition was successfully completed. What to do? So we decided to climb something! 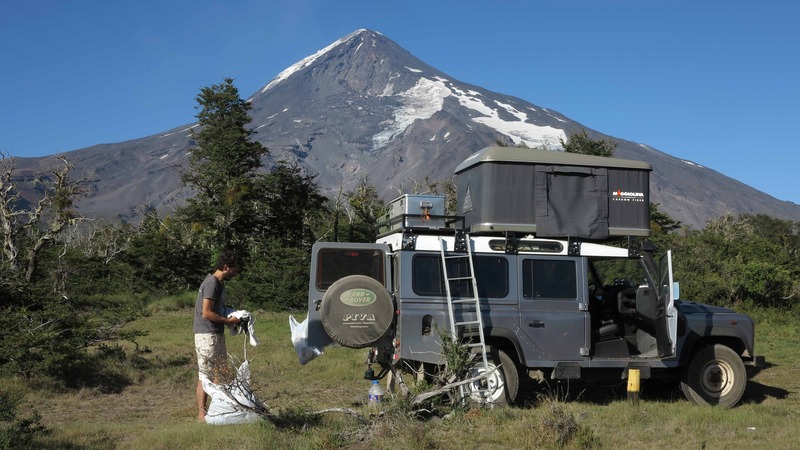 First we drove to the Volcan Lanin National Park to climb the beautiful Lanin volcano right on the border to Chile. 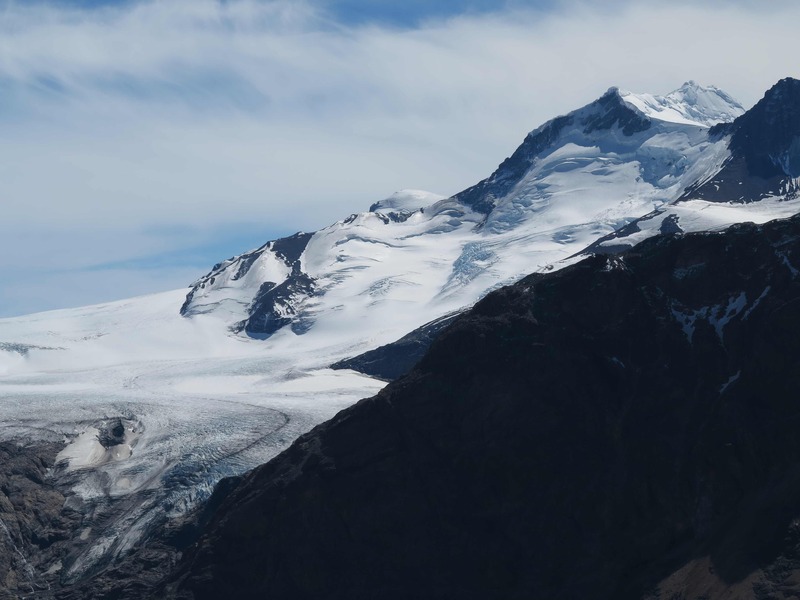 But…..we had all the required equipment including crampons and ice axes and helmets etc but we did not have a VHF radio so we were not allowed to go to the peak by the park rangers! We made a day trip to the upper hut and came down to drink some beers and drown our sorrows. 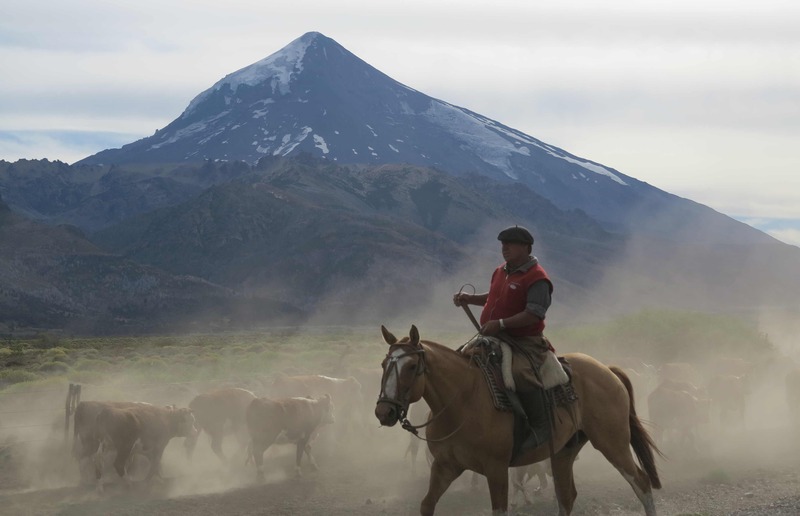 Gaucho working with the cattle – on the way to Volcan Lanin. 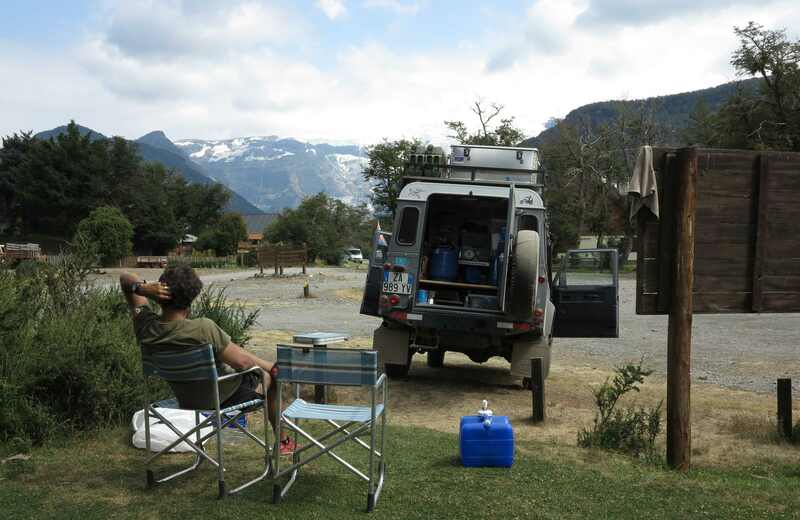 Frida parked at the foot of Volcan Lanin, 3747 m. Preparing to go for a hike the next day. 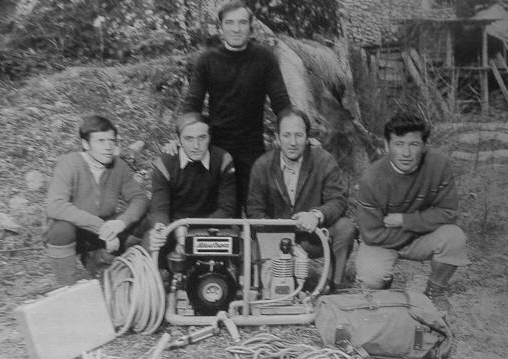 Unfortunately we could not get the permit to go to the summit because we did not have a VHF radio! This is as far as we were allowed to go. 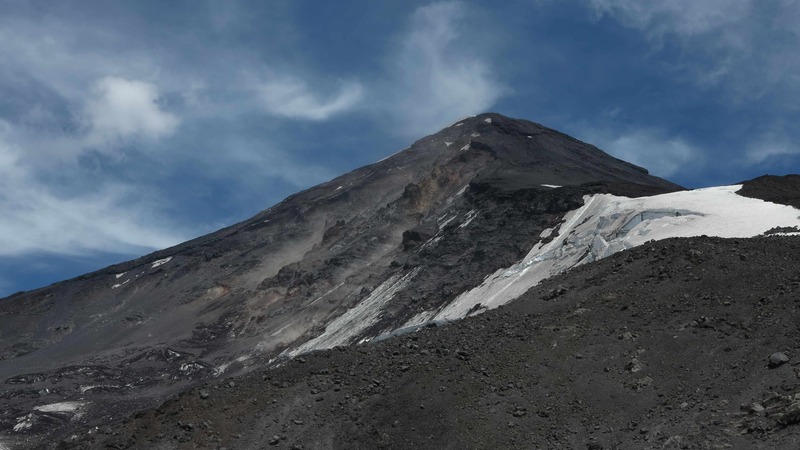 At the upper refugie on Volcan Lanin. 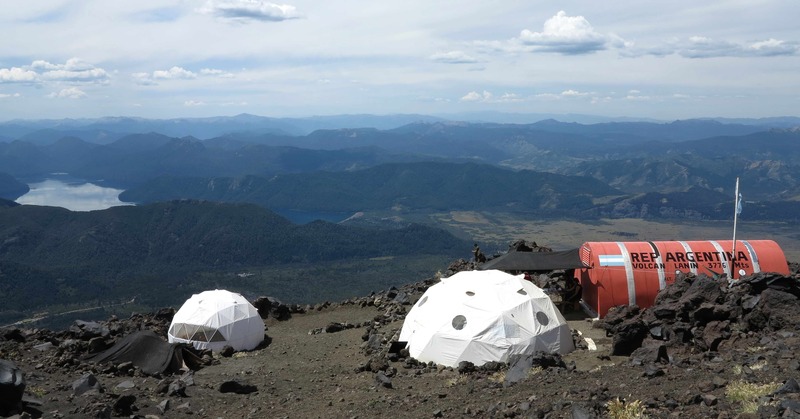 The military refugie on Volcan Lanin. 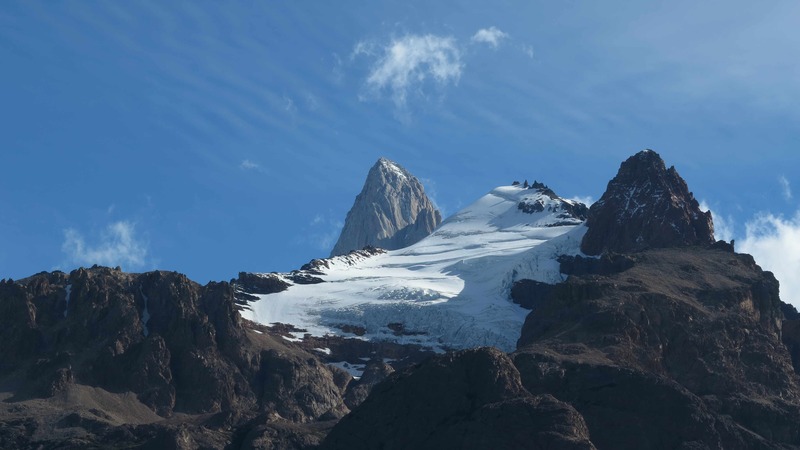 After our failed attempt at climbing the Lanin Volcano, we drove further south, through Bariloche where we stopped only to buy one kilogram of our favourite Argentinian chocolate and then we continued to the lovely Monte Tronador. But alas, conditions were not good. 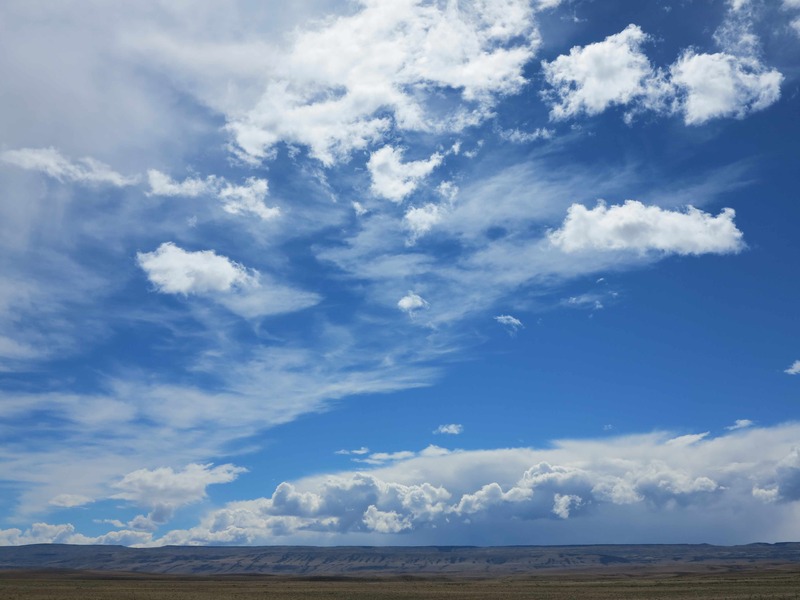 The weather forecast was bad for the next couple of days and we were not committed enough to wait that long. Marco and Frida at the start of the trail to Monte Tronador. We spent the afternoon putting all our stuff in order while we watched the clouds closing in on the mountain. 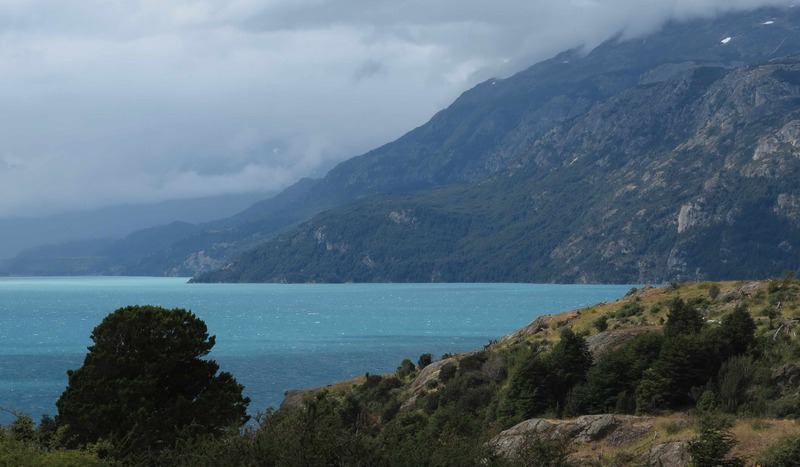 South of Bariloche, we made a detour into Chile to drive the Carretera Austral, a gravel road which provides access to the beautiful and very sparsely populated southern part of Chile. 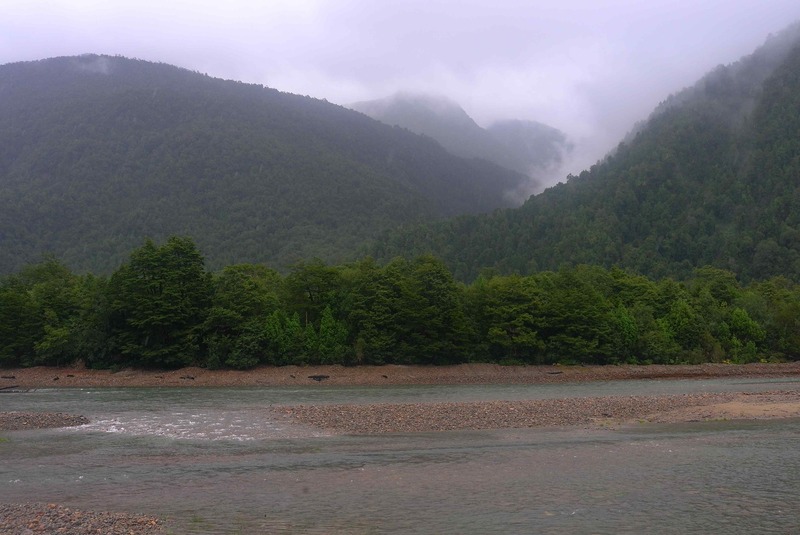 Unfortunately the Carretera Austral is a road of very bad quality and the climate of southern Chile is very wet so the experience was mixed. After 3 days of very slow driving and very cold weather we decided to pop back into sunny Argentina! 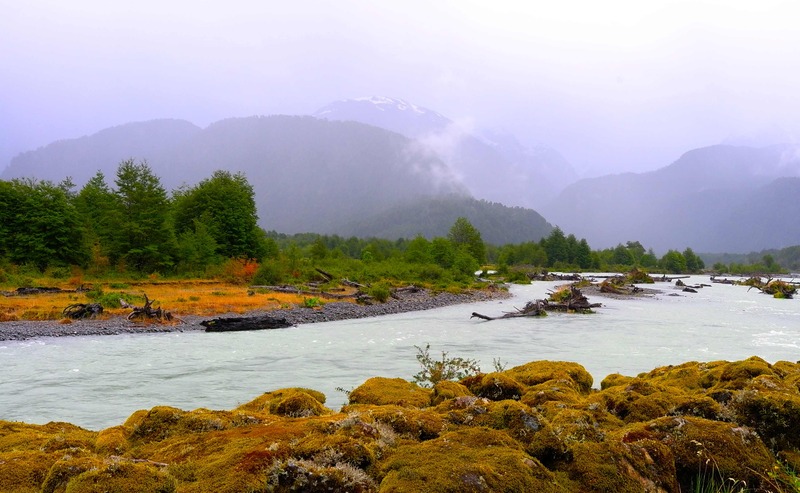 Chilean Patagonia is a wild and beautiful region but it is also very wet and cold. Most of the time it was either raining or almost raining! 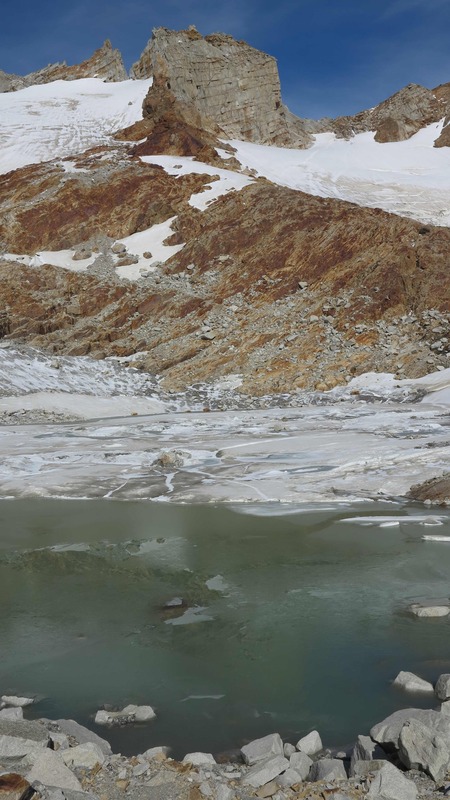 Turquoise coloured river water from the glaciers. Rounded valleys reminded us of Norway. 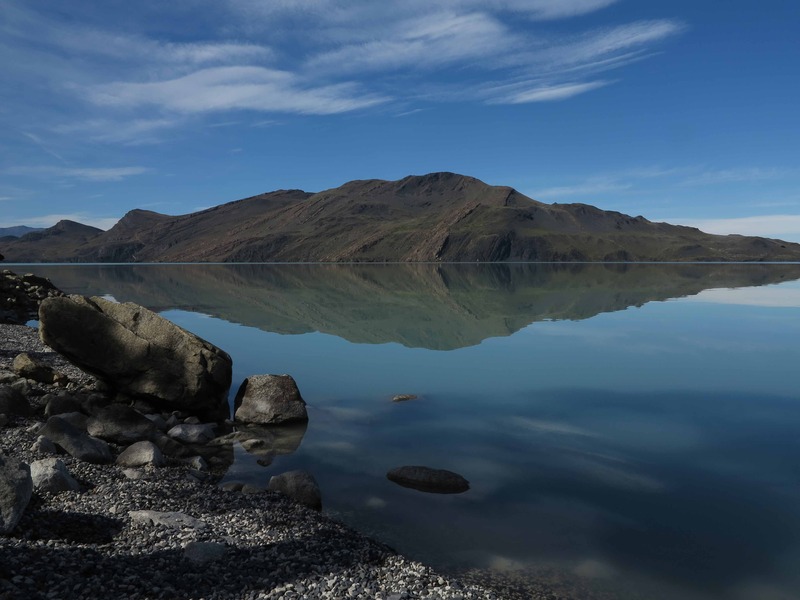 Beautiful lake views – photos taken at the rare moments of sunshine! The rainbow ends in Chile! 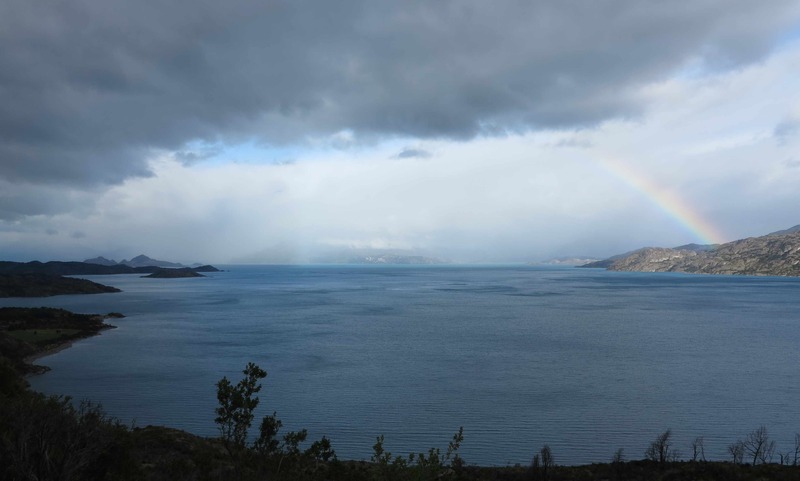 Almost back into Argentina, looking back to the dark and heavy clouds looming over Chilean Patagonia. 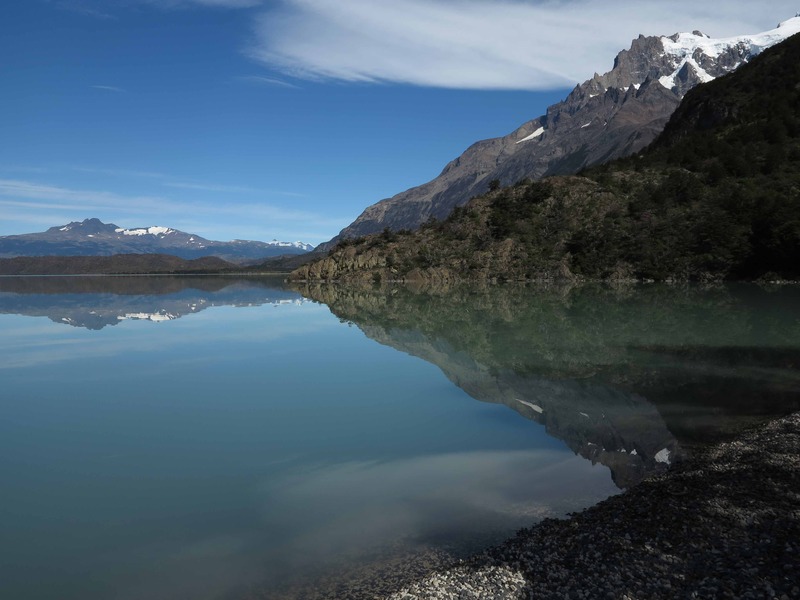 Beautiful Patagonian pictures, what else can I ask to see when I wake up? Thanks M&M!!! You have a little of envy from my side…. Your native land is fantastic! 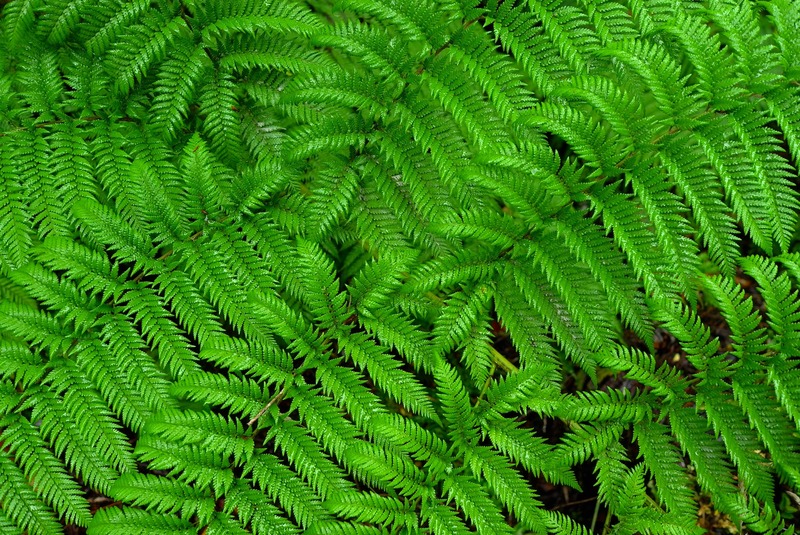 Proud to be here and to send you all nice pictures of this fantastic part of the earth!